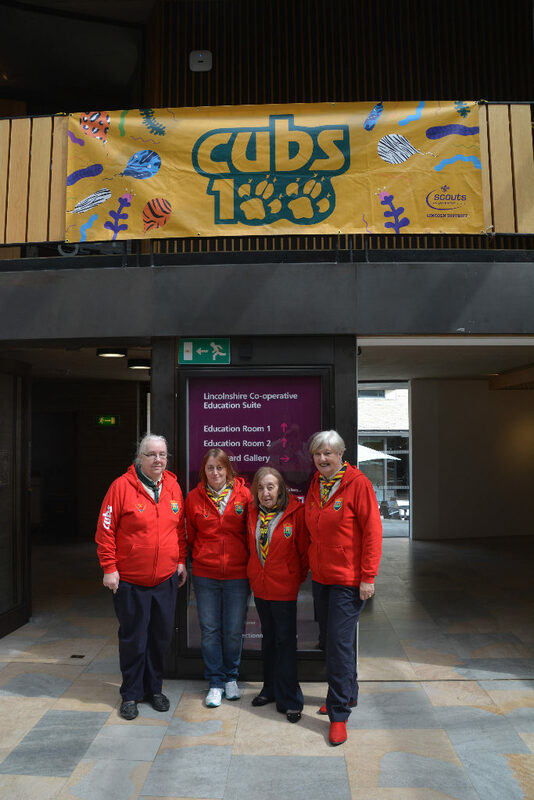 It was with great sadness that we all heard the news that Jean Revill (BALOO to the Cubs) passed away peacefully on the 13th July 2016. 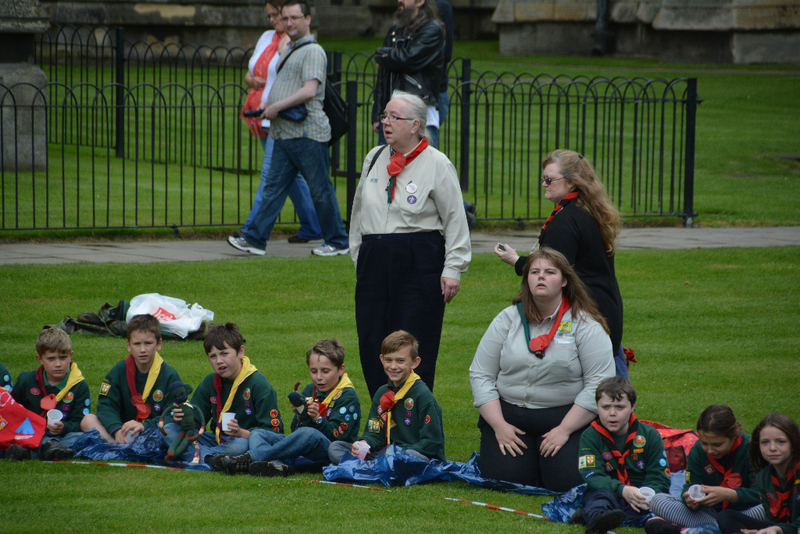 As you may know she has been struggling with her health for some time but managed to attend our Thanks event, the Queens Tea Party, the joint pack night with Bailgate and receive her Silver Wolf on St Georges Day this year. 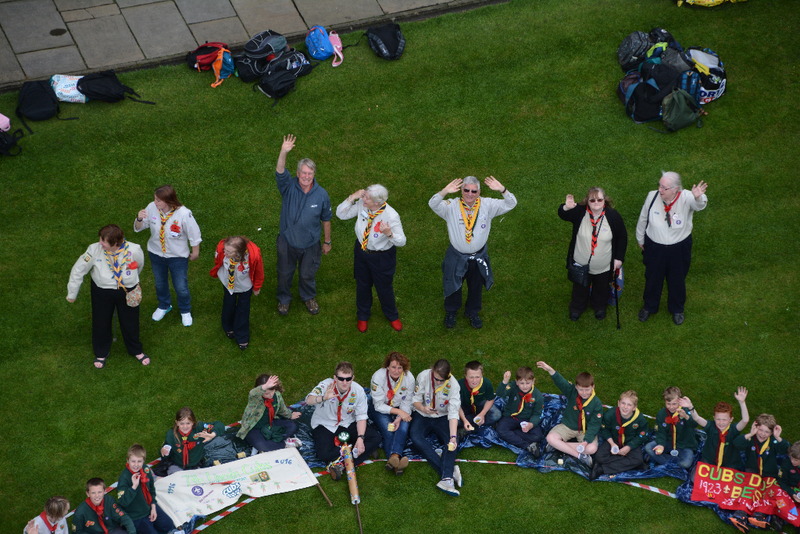 80 years involvement with Scouting and Guiding What an achievement!! 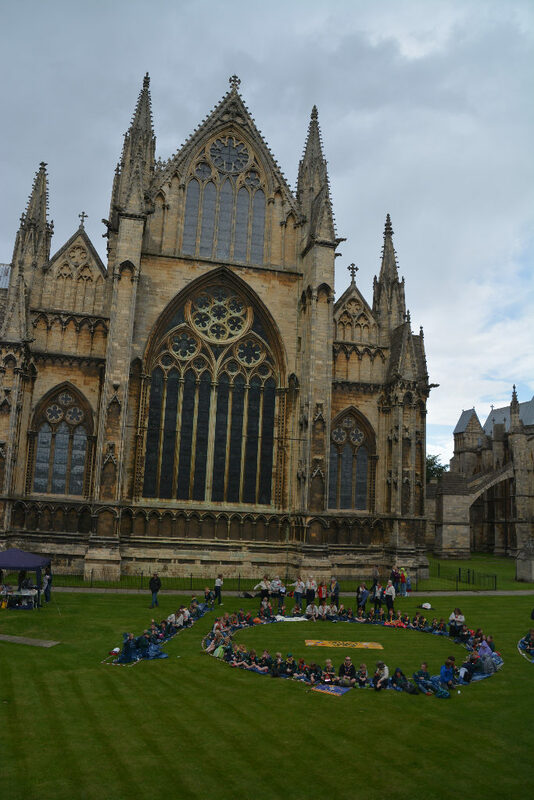 On Friday 12th June 1936 Jean finally reached her 7th birthday, she had been waiting for that day for many weeks looking through the old School room window where the Brownies met in Bailgate, as she passed with her mum every Saturday morning. 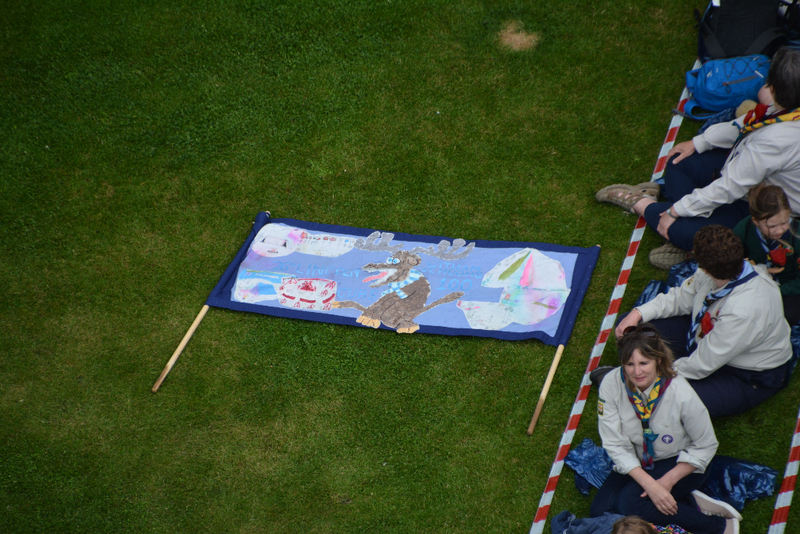 So on 13th June 1936 Jeans involvement with Guiding and Scouting began, she idolized her Brown owl Miss Miller, in Jean’s words, she could, tie knots, light fires, make a bed with the ends tucked in, knit, sew, make toys, tell wonderful stories, sing songs and play lots of games. 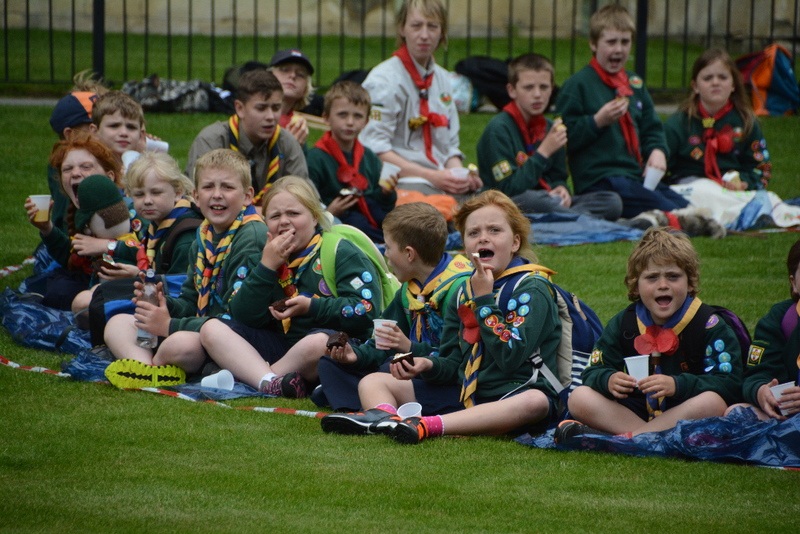 That same year Jean went with the Brownies to Hartsholme Park for the visit of Robert Baden Powell to Lincoln. 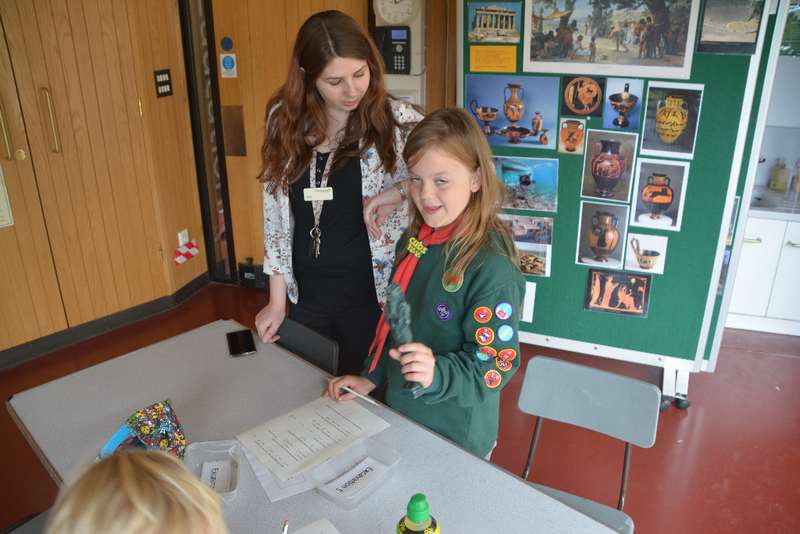 After an exciting 3 years in Brownies Jean Joined Guides and continued to be fully involved and enjoy everything they did, it was the war years so things were not easy. 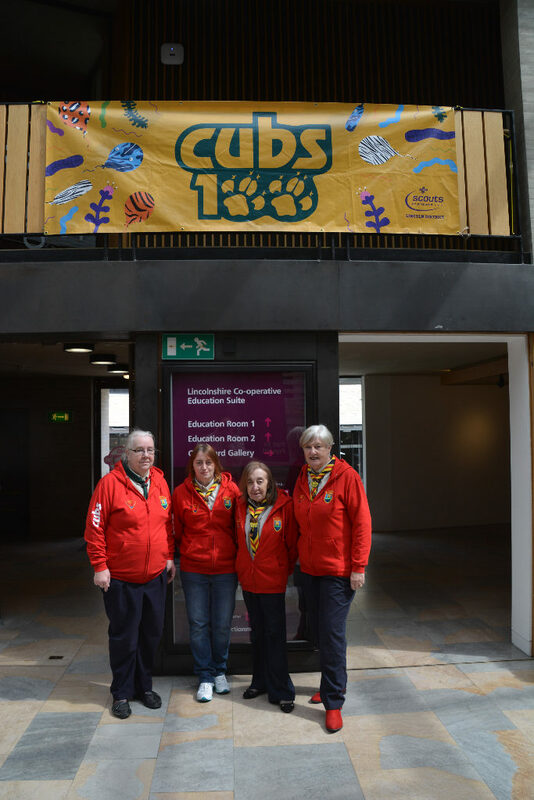 In 1942, Jean became a Ranger, she started to help out at the Brownies and the following year as most young men were away on War duties, she was asked to help at the Cub Pack. 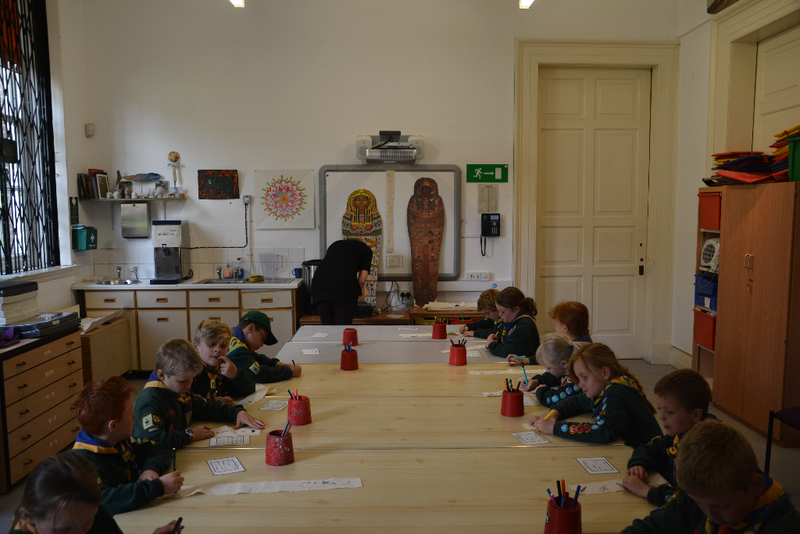 She was a little unsure, as she had not worked with boys before but agreed to give it a try and found it great fun. 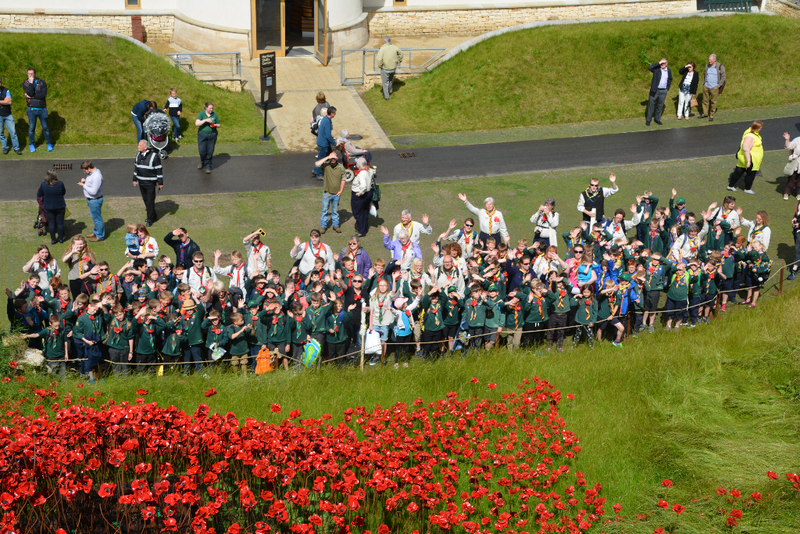 After doing her training and getting a warrant, she attended camps and St Georges day parades. 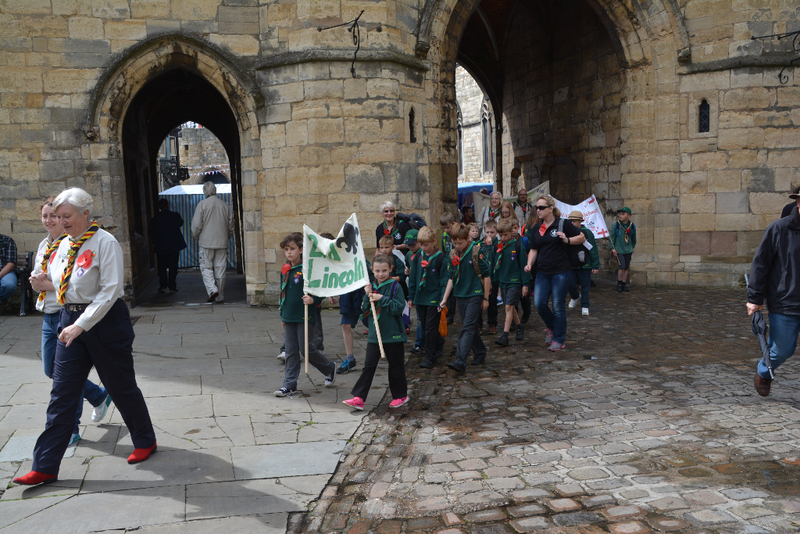 St Georges day Parade was still the main occasion of the year, at that time, on the Friday night before the Sunday parade all the District met at Bailgate Church for a practice march to the Cathedral. 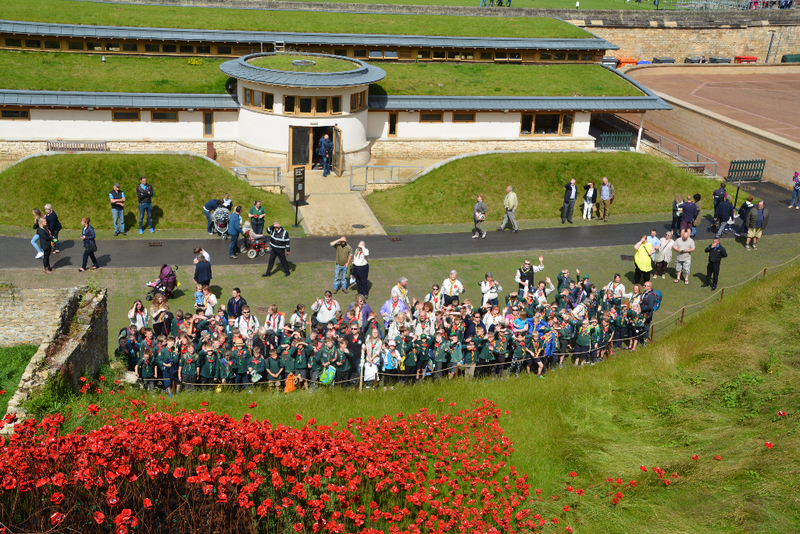 It was at the Friday practice in 1946 that Jean met Geoff and romance blossomed. 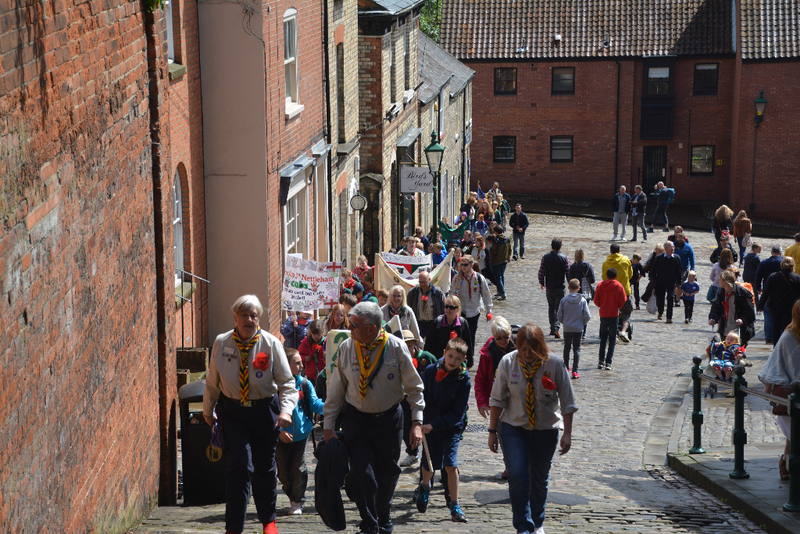 Geoff had restarted the Saxilby Scouts just after the war ended, and so the link between Saxilby and Bailgate got stronger. 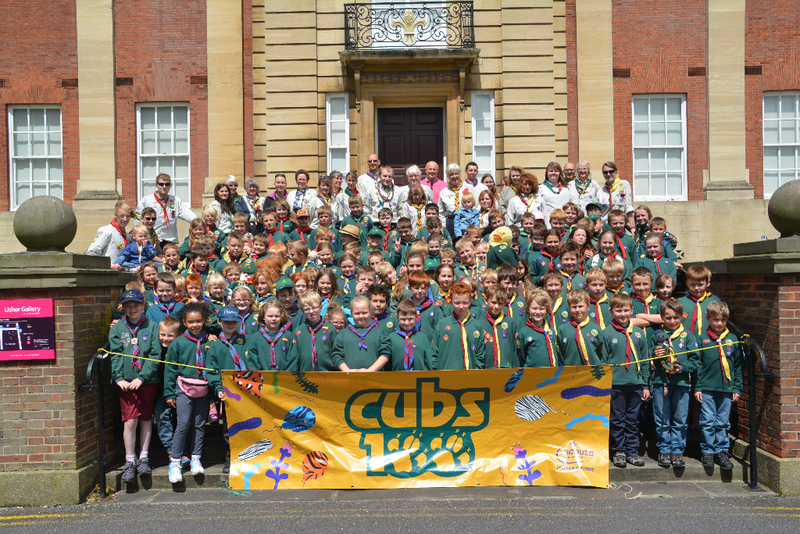 After coming over to Saxilby regularly to help Geoff with Scouts, Saxilby Cubs were finally started in 1949. 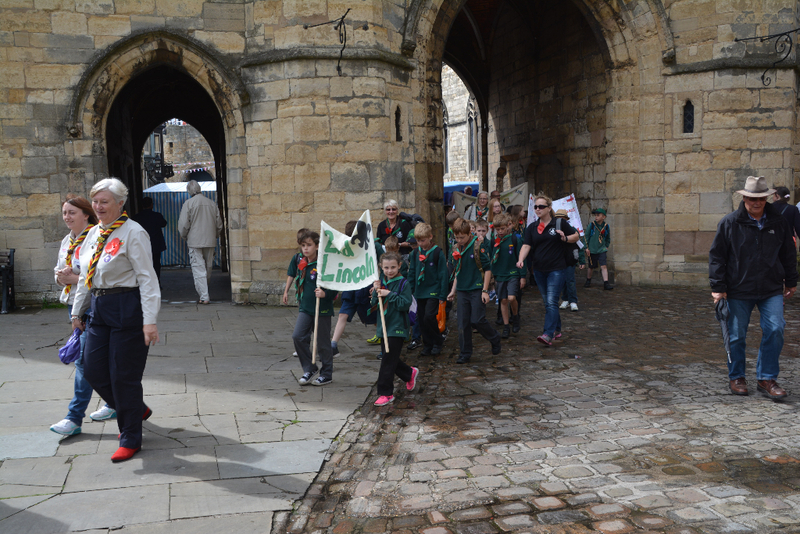 Jean married Geoff in 1951 at Bailgate Chapel with a Guard of Honour, made up of Cubs and Scouts carrying their Flags. 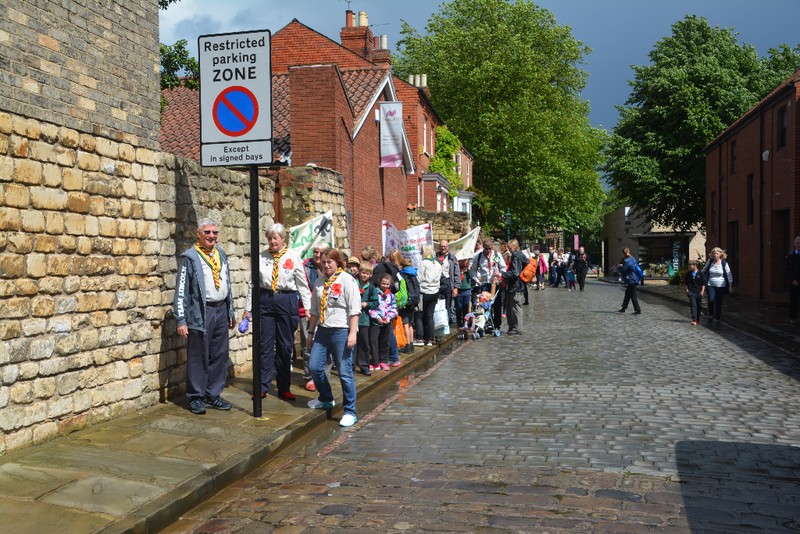 Jean then came to live with Geoff’s mum in Saxilby and left her Bailgate Pack to concentrate on her Saxilby Pack, which by that time was thriving with a long waiting list. 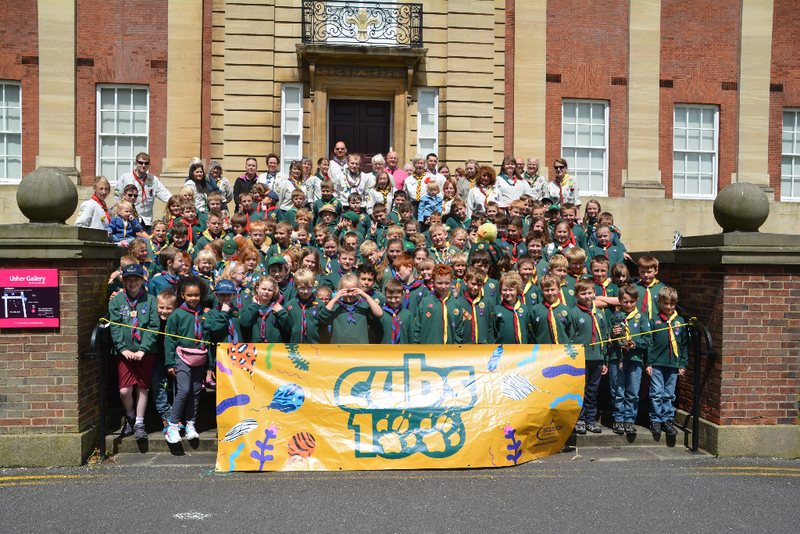 In 1953 the Saxilby Group was officially registered with Scout HQ in London and was growing quite fast. 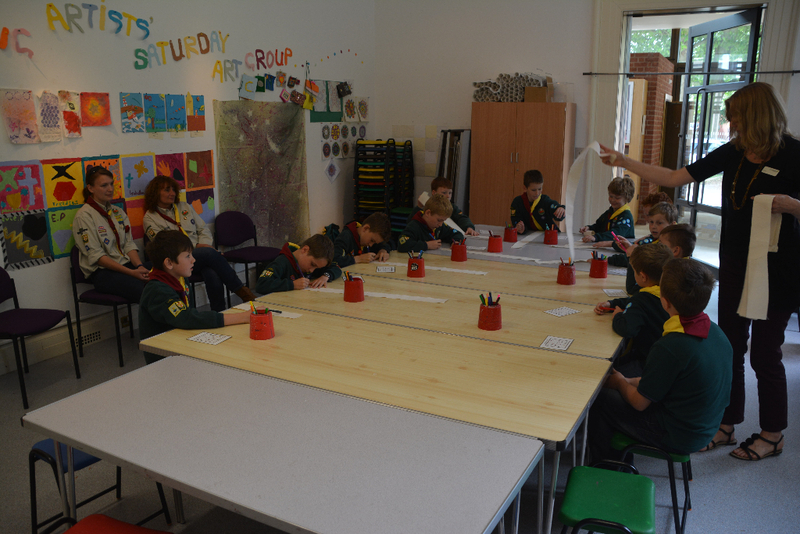 By 1955 it was decided that the group needed its own HQ and Mr Morton (Snr) kindly supplied an old Painters hut from Pelham Bridge, on the understanding that the scouts raised £100 towards its cost. 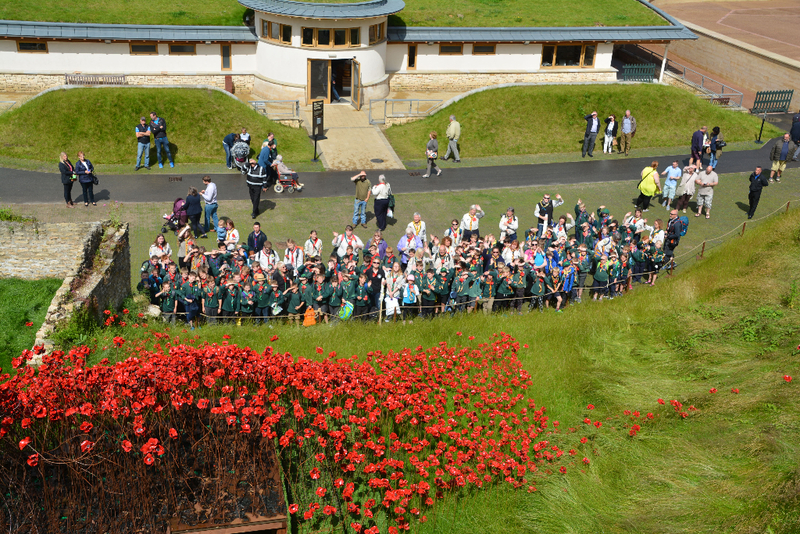 Fundraising took place and the wooden building was erected on the Memorial field on the same site as the current HQ. 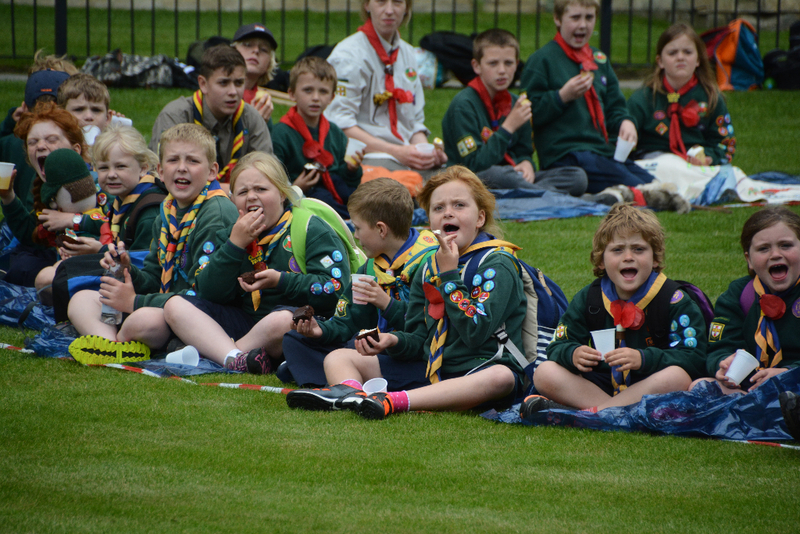 The Saxilby Group produced a Panto in 1955 “Little Red Riding Hood” it was very successful so the following year “Humpty Dumpty” . 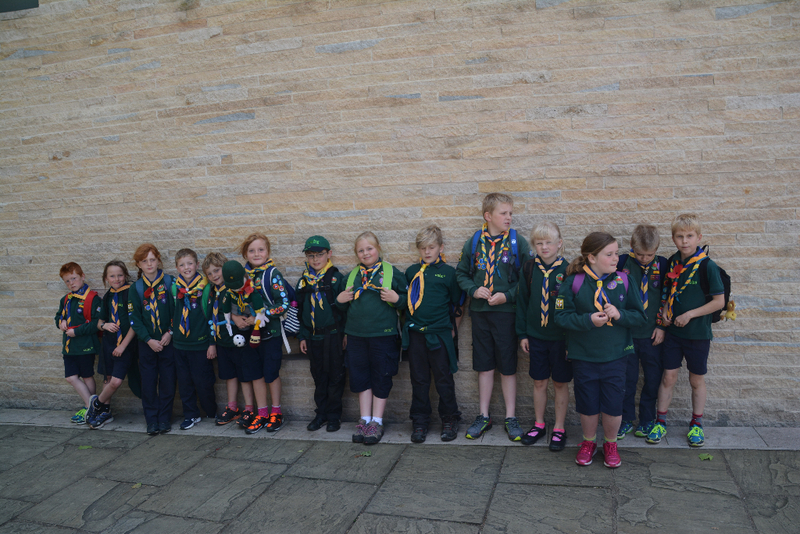 Geoff’s Medal of merit for his services to Scouting was awarded in 1956. 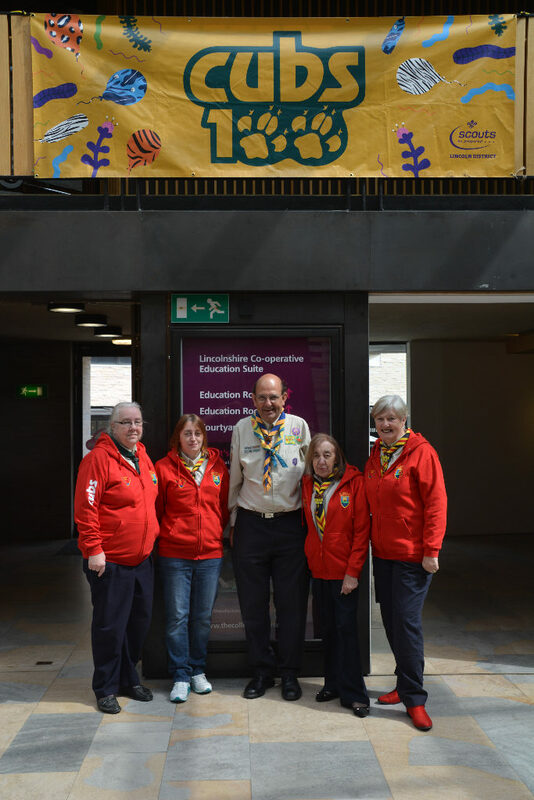 In 1959 the girls of the village wanted to start a Brownie pack and Guide company, so as Tawny owl, Jean assisted Gill Pacey and Mary Gelder, in starting both. 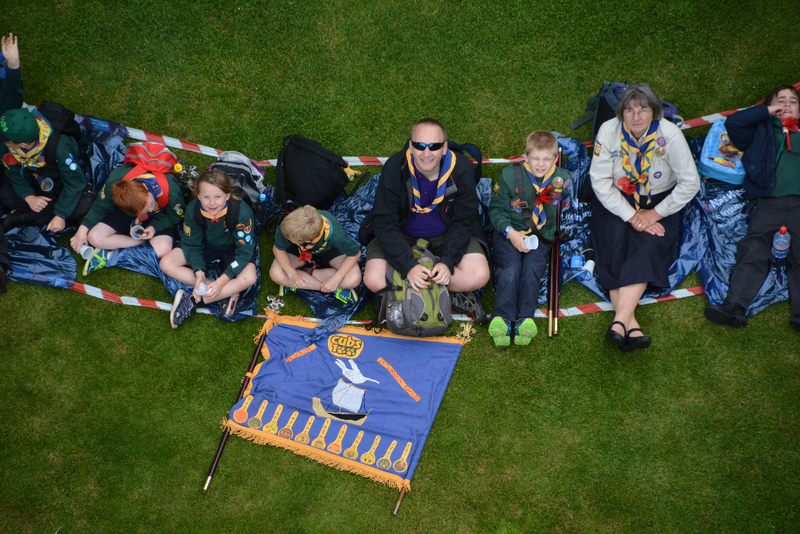 In 1961 Jean, Geoff and the family moved to Bridge Place, with the HQ just outside their back gate! 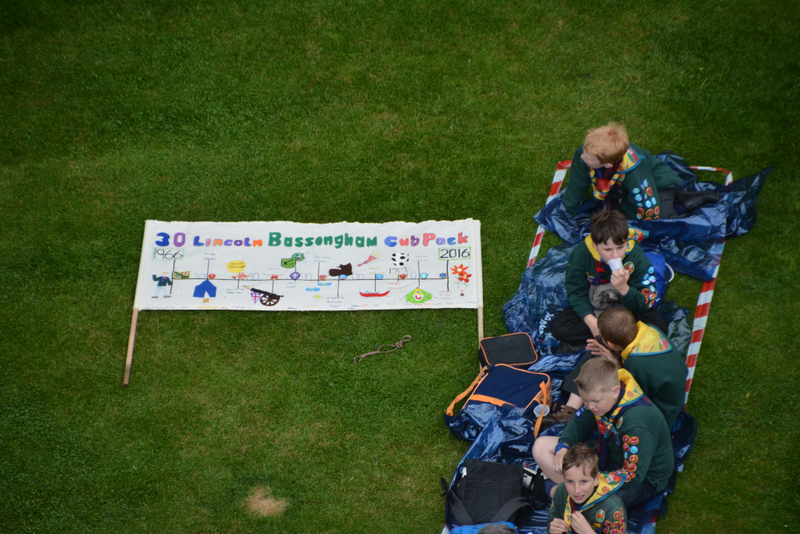 Numerous activities and events took place in the 50’s and 60’s, including a visit of Olave, Lady Baden Powell to Market Rasen in 1965. 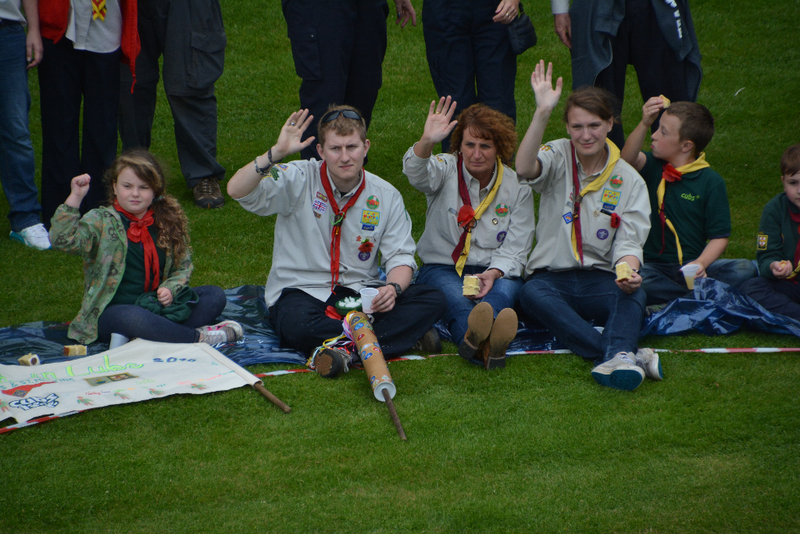 During this time Ian Joined the Cubs and Janice helped her mum as an assistant Leader (Baloo). 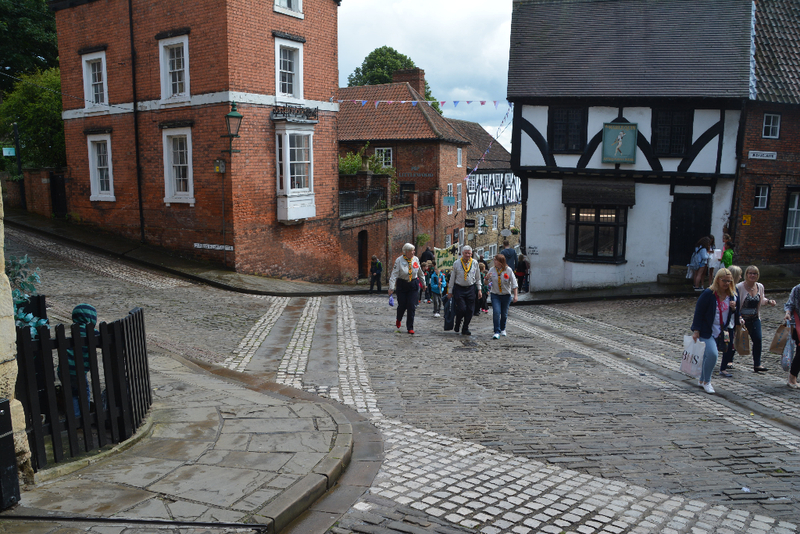 Jean was always very proud to show the picture of Ian, Janice, Geoff and herself at the Castle in 1969, when Ian carried the flag at the St Georges day Parade. 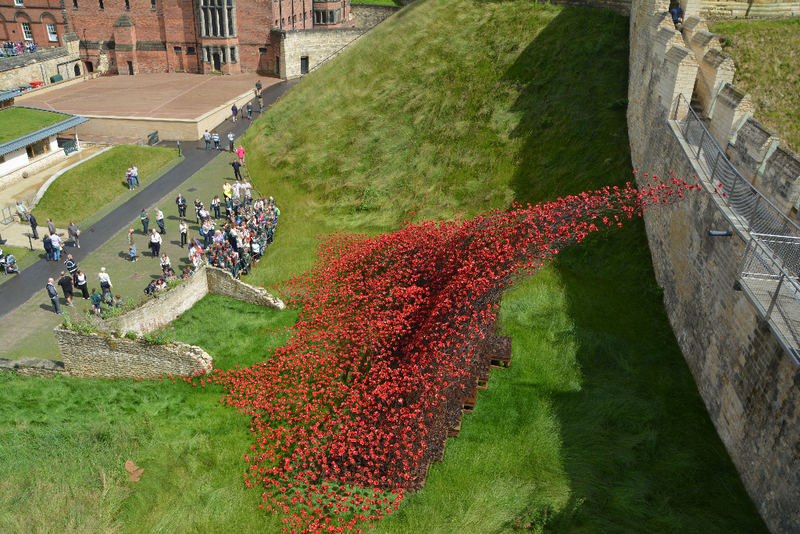 Sadly in 1970 Geoff passed away. 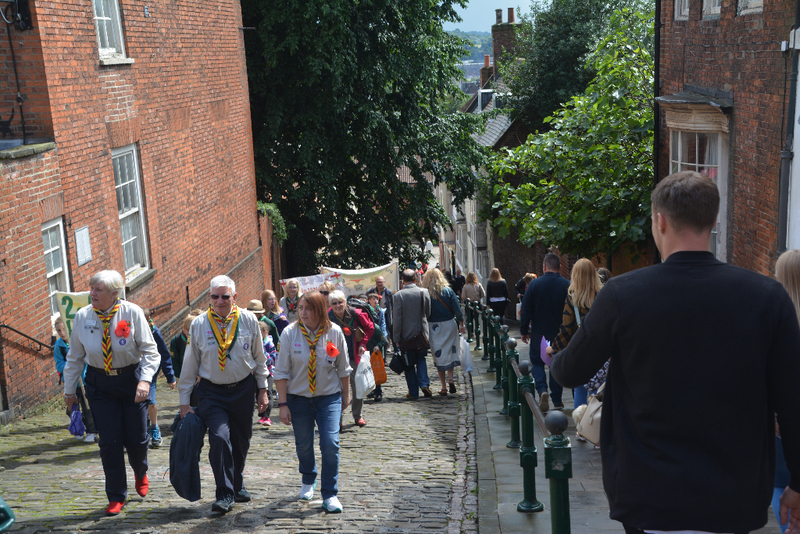 It was a very upsetting time for everyone but Jean knew Geoff’s wish would be for her to carry on with Scouting, so with help from Gillie and Colin Hardwick Scouts kept running. 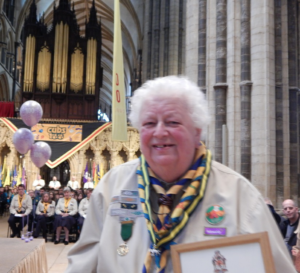 Derek came along to help in the early 70’s and in 1971 Jean received her Scouting Medal of Merit, followed in 1973 by her Guiding long service award. 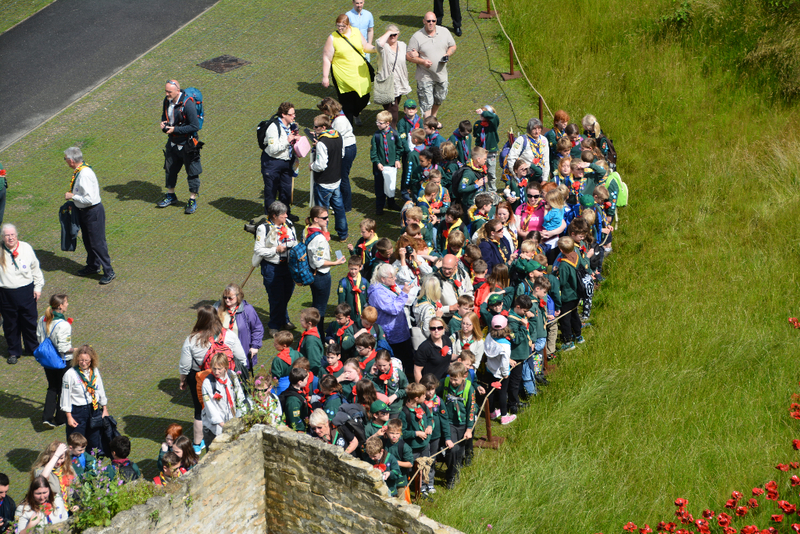 Jean married Derek in 1976 and as her picture show’s Brownies, Cubs, Guides and Scouts lined the path from the chapel door. 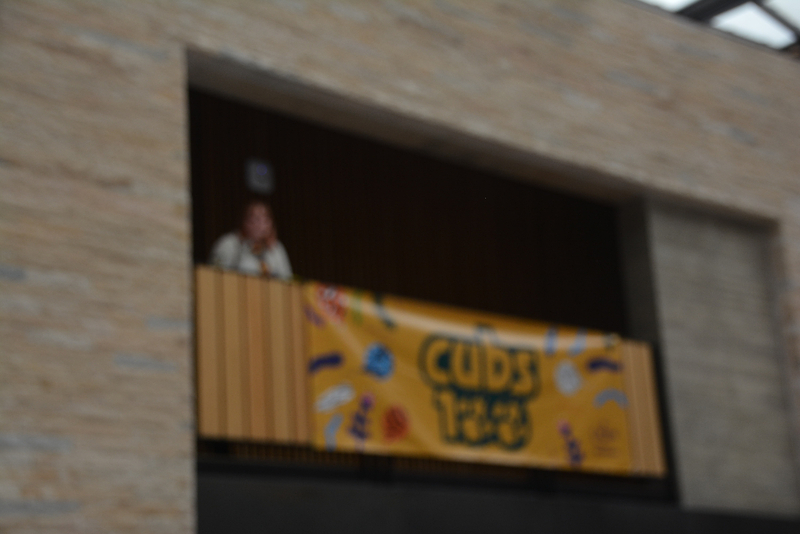 In 1977 the decision was made to build a new brick HQ next to the wooden building on the rec. 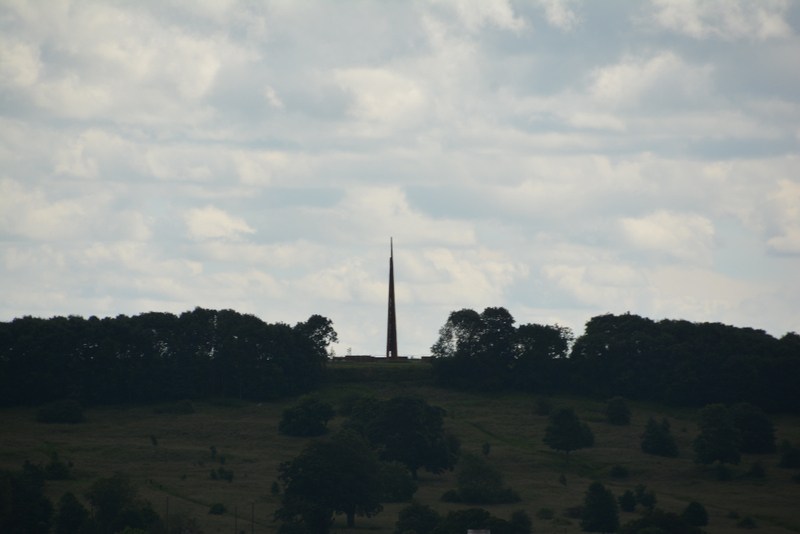 it was completed in 1979 and opened by Jean. 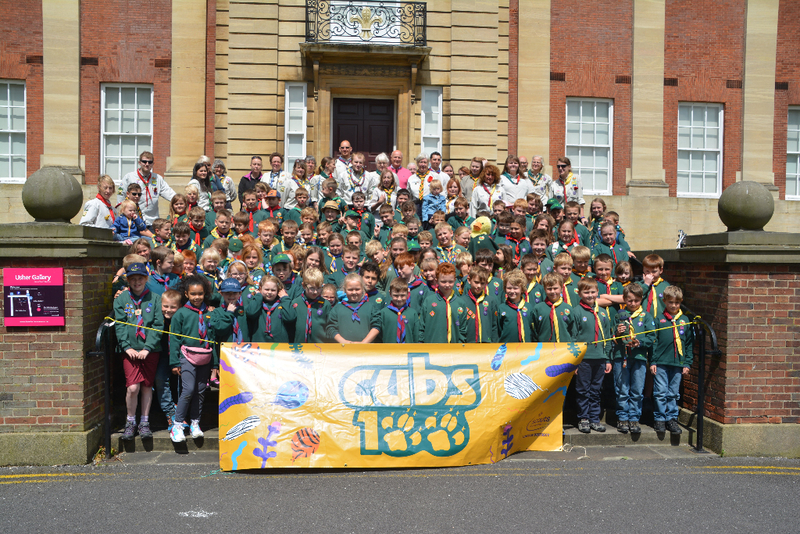 In 1981 my wife and I joined the Group and took over the Cubs, Jean became Baloo, a title she held for 35 years! We did our first Gang Show with Jean’s help in 1982 and built the first extension to the HQ in 1983. 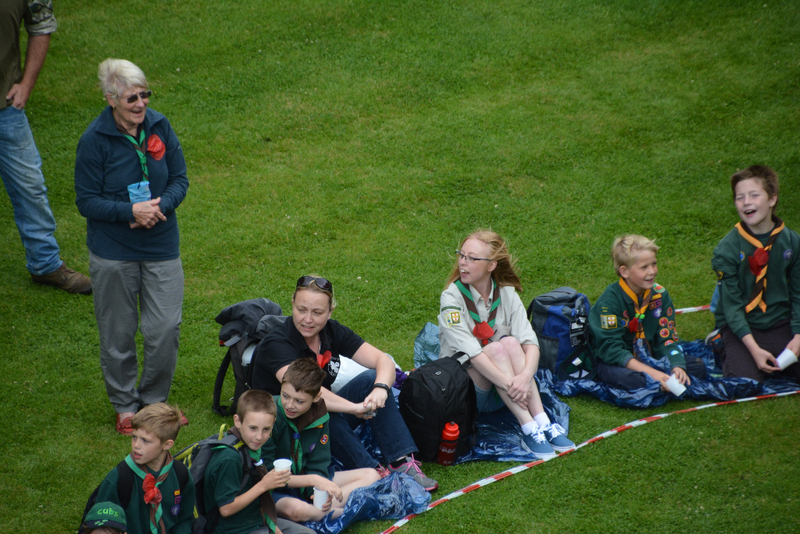 Jean was invaluable with her advice to leaders and children, sitting to help with records and pass on her vast Scouting knowledge. 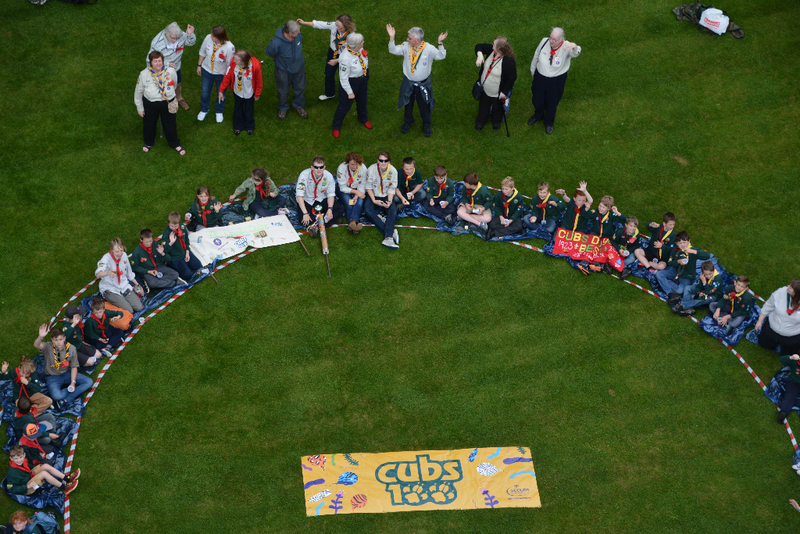 In 1996 Jean achieved her 60 years since joining Brownies, but was determined to carry on with her Scouting with Cubs and the fellowship, for as long as she could. 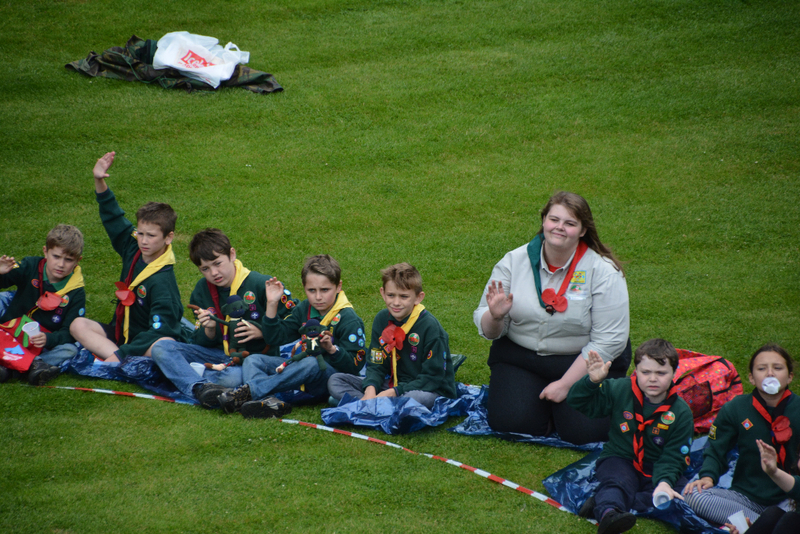 In 2005 she was awarded her Silver Acorn and 2011 saw her awarded the Bar to the Silver Acorn. 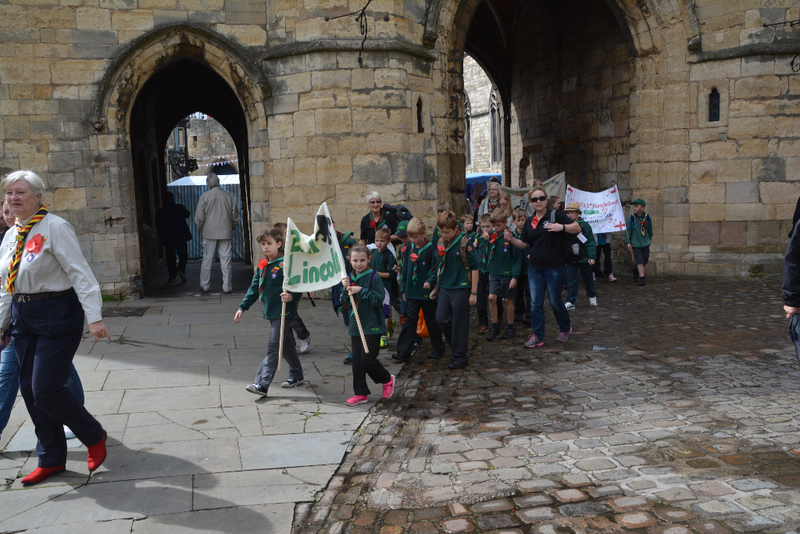 She continued supporting as many events as she could completing 12 Gang shows with the Group and a number at the Theatre Royal with the District. 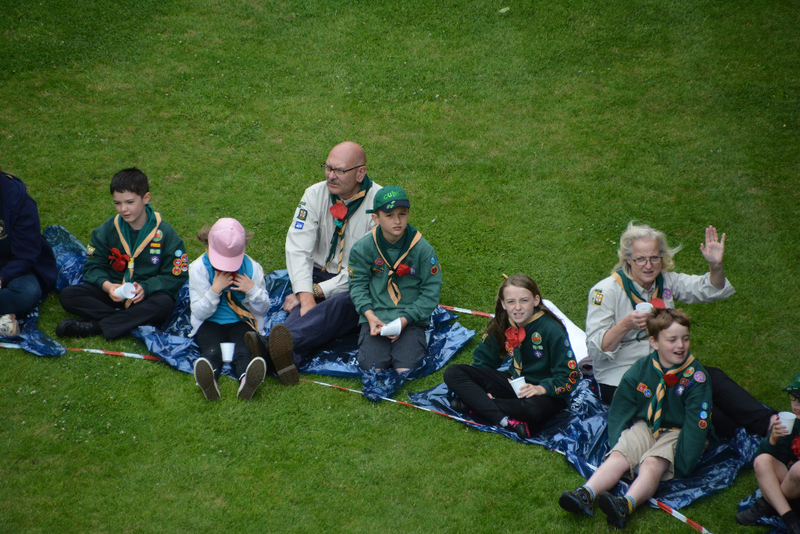 As her health deteriorated over the last two years she was unable to be so active but always tried to be present at Church Parades, remembrance services and of course St Georges day Parade at the Cathedral. 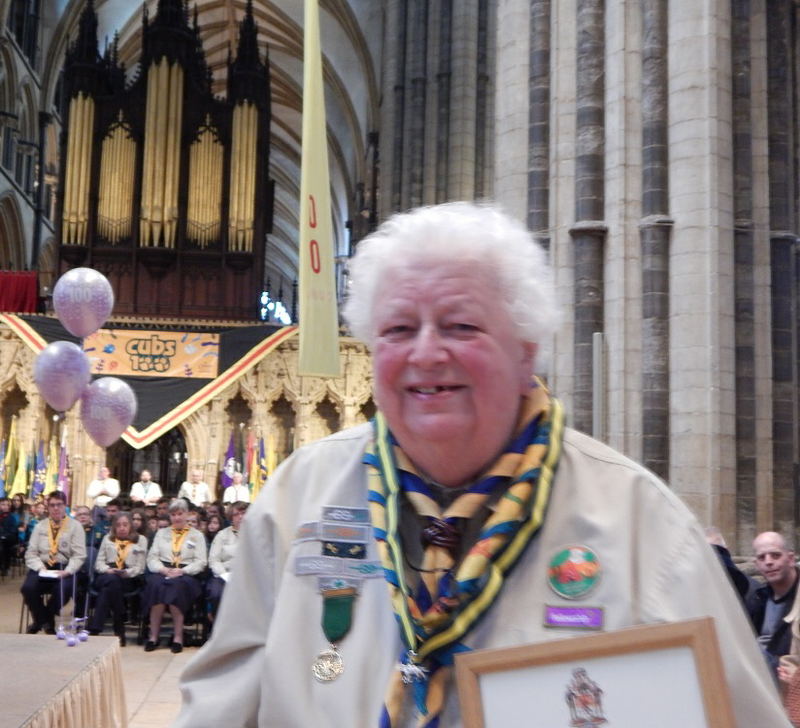 At St Georges day Parade this year Jean was awarded a Silver Wolf, the highest award in Scouting, and helped us organize our thanks Event to celebrate 100 years of Cub Scouting. 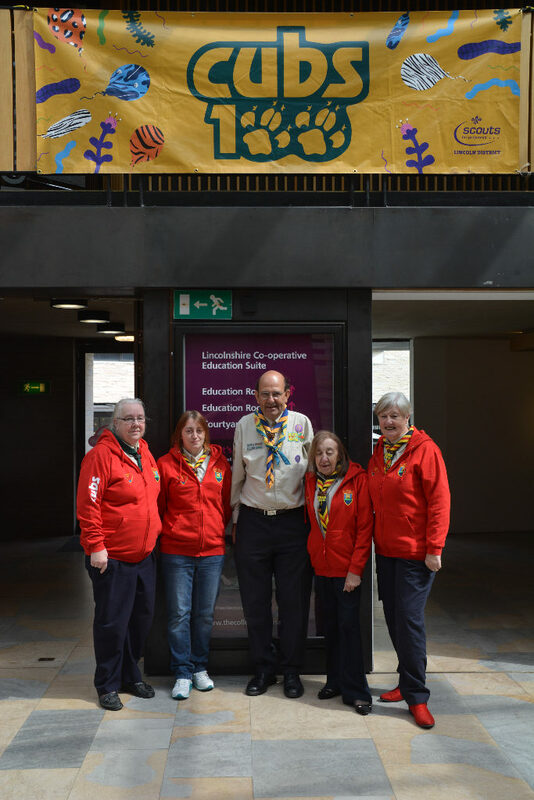 On 12th June, her Birthday, she came over to the HQ to join us for the Queen’s Birthday, and we all celebrated Jean’s 80 year involvement since joining Brownies, so many years ago. 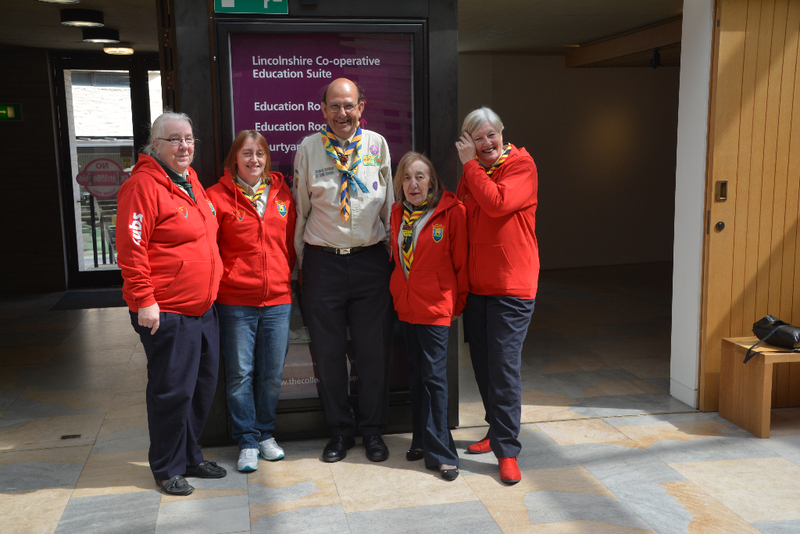 It has been a privilege for me to be associated with Jean for so many years, she was a very Special lady and her example has been an inspiration to everyone. 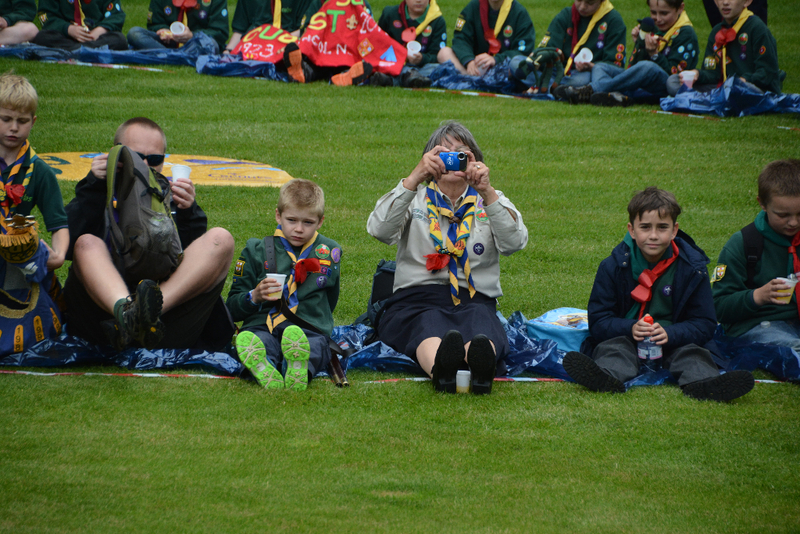 It is with great sadness that we have to relay the news that Jean Revill passed away peacefully last night (13th July 2016). 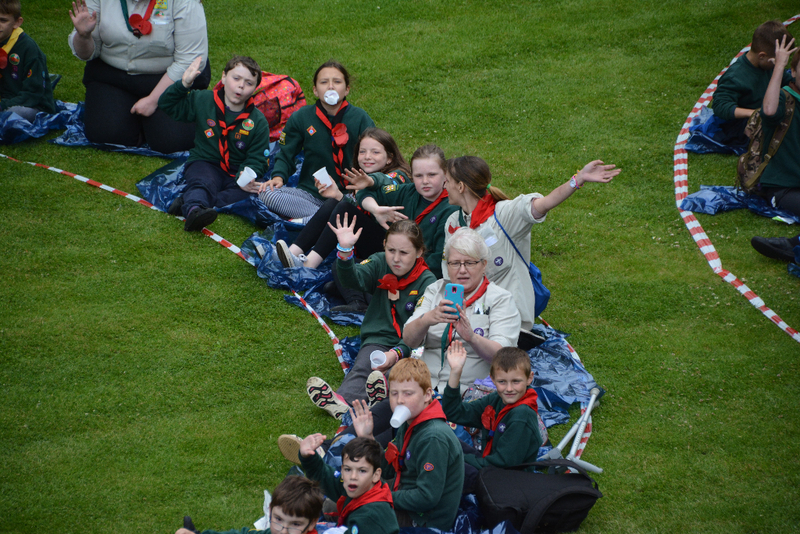 As you may know she has been struggling with her health for some time but managed to attend our Thanks event, the Queens Tea Party and receive her Silver Wolf on St Georges Day this year. 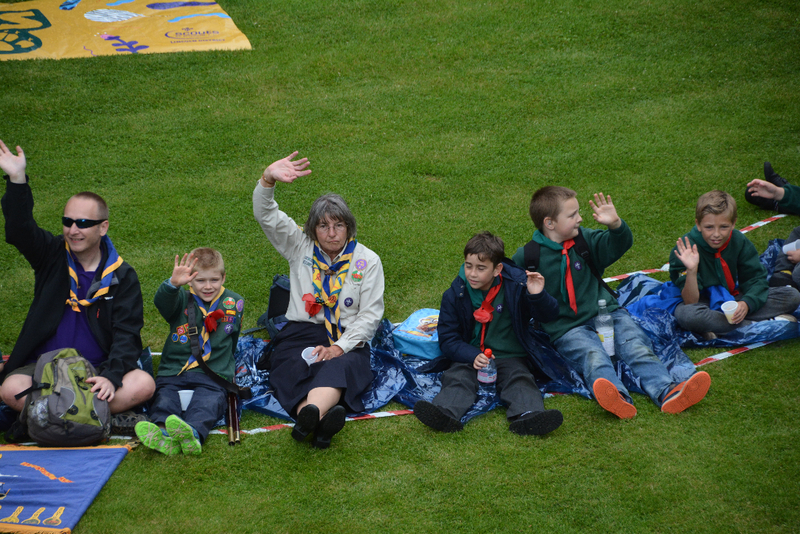 Jean has achieved an awful lot in her lifetime and her memory will never be forgotten for her contribution to Scouting and Guiding in Saxilby. 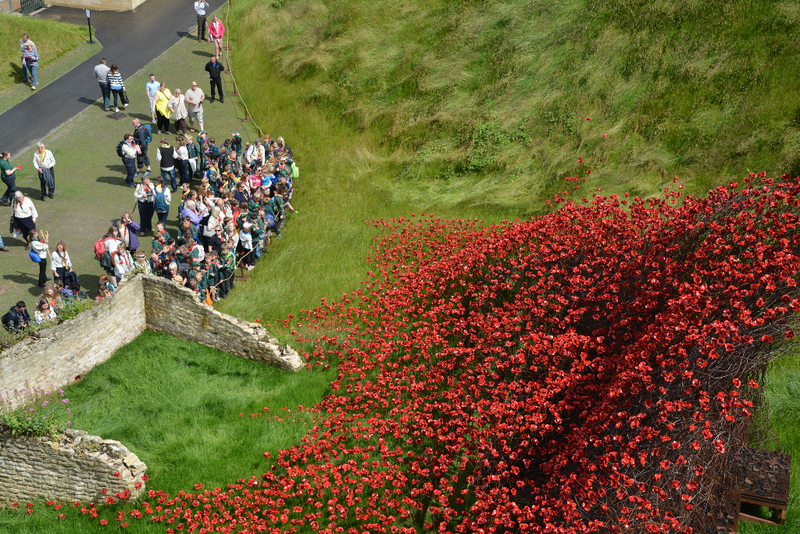 Obituary and Further information will be posted when available. 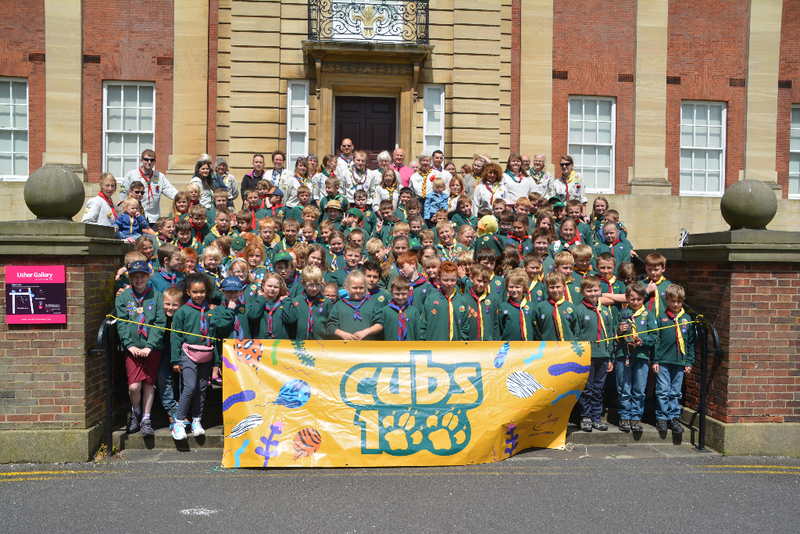 On 3rd July 2016 the Cubs of Lincoln District gathered together for a special event to celebrate our 100 year anniversary. 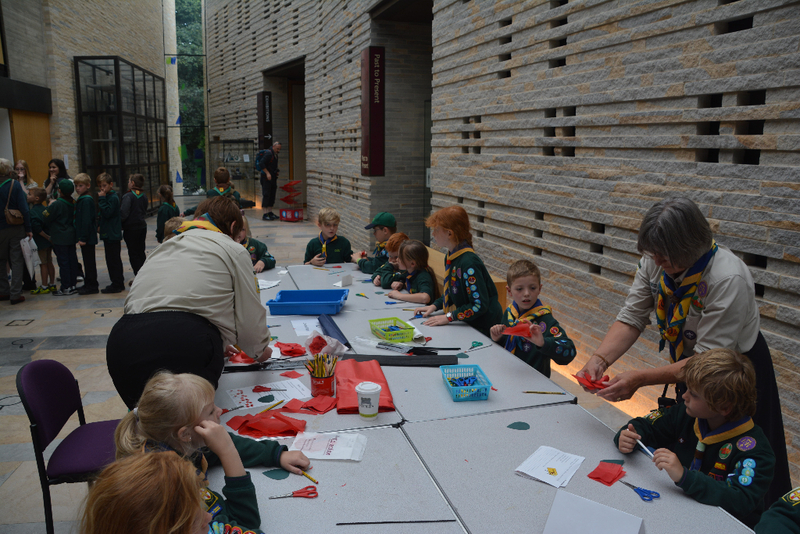 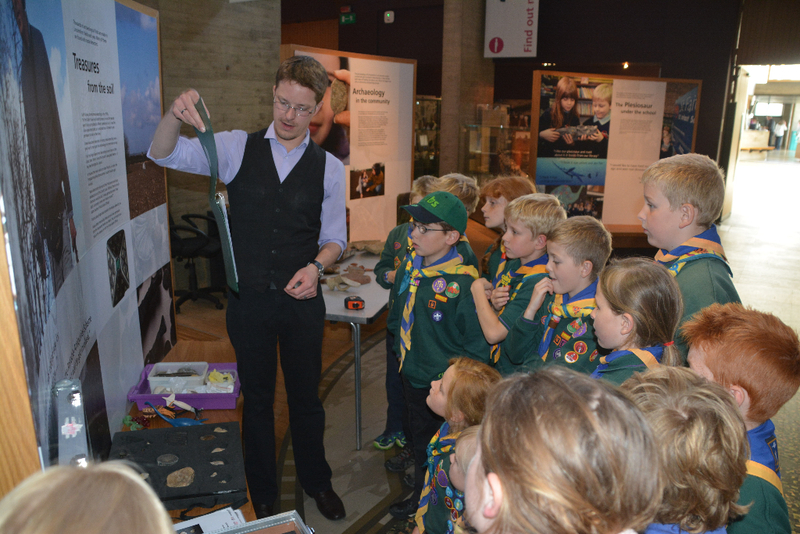 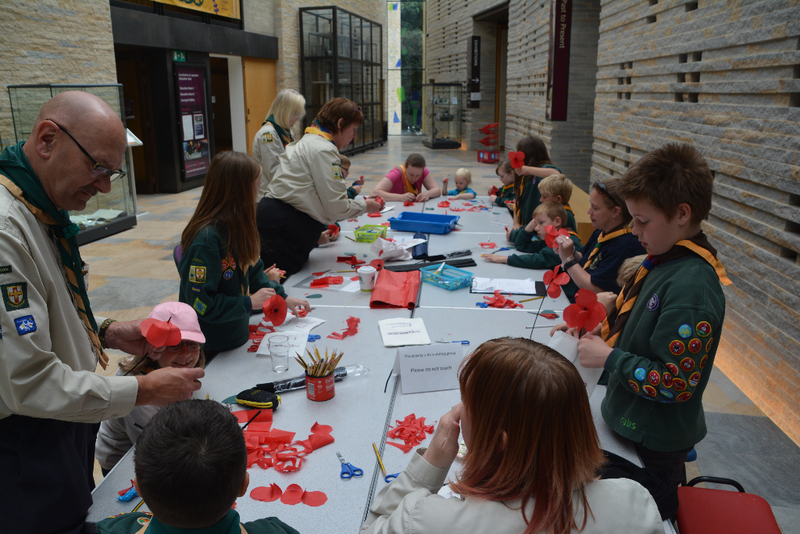 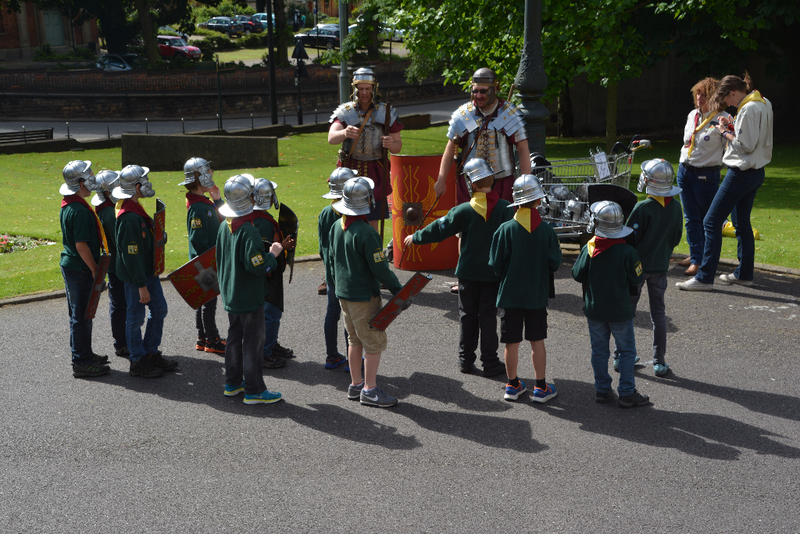 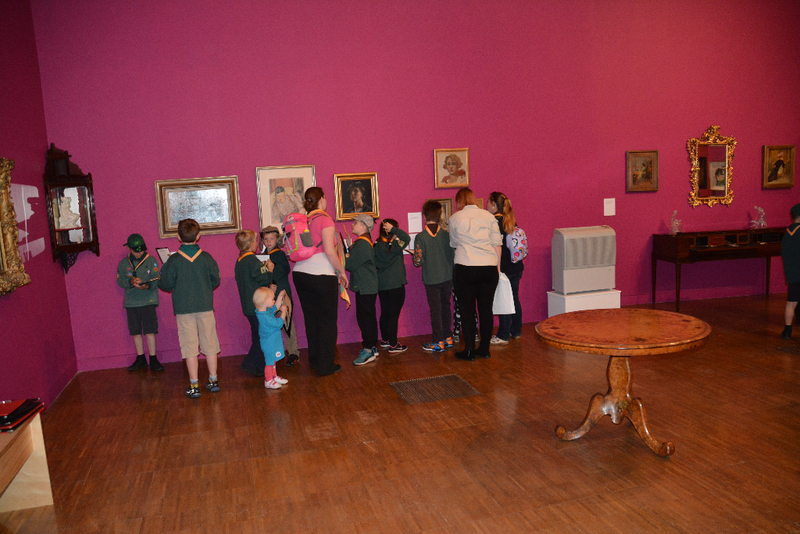 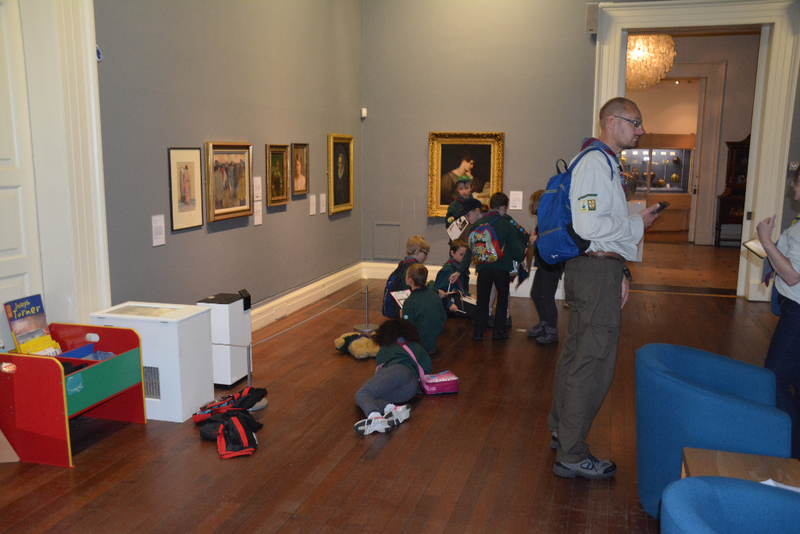 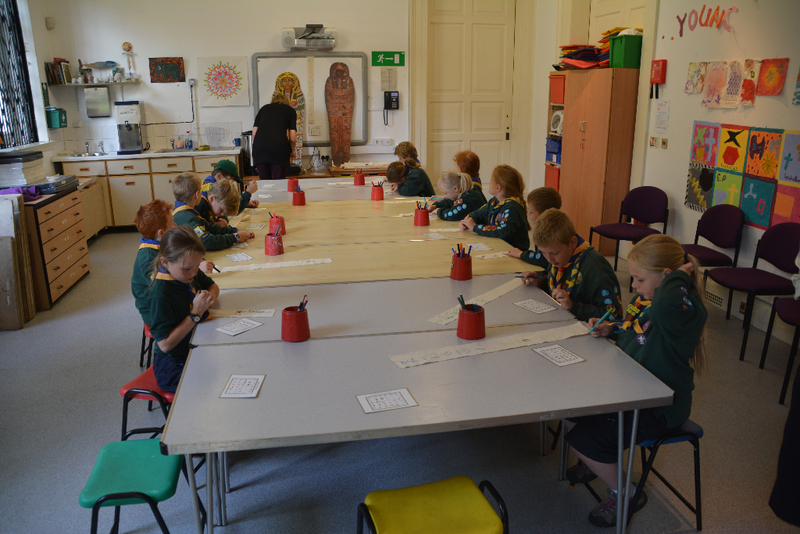 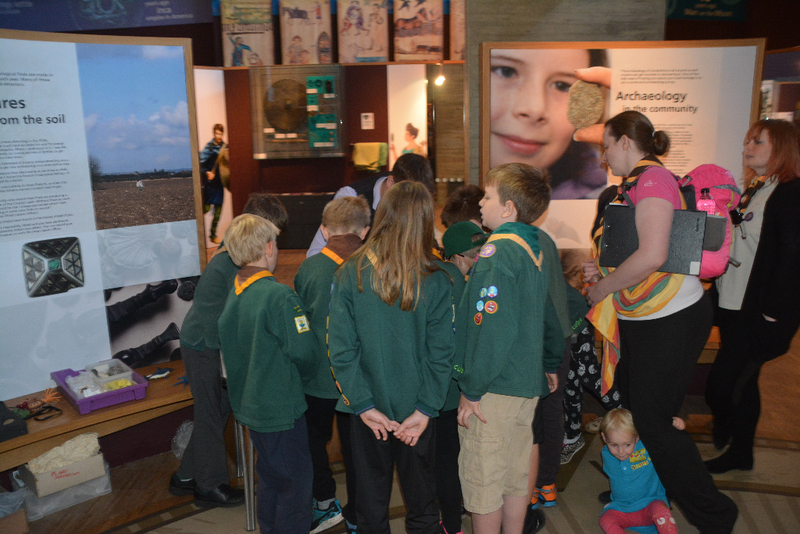 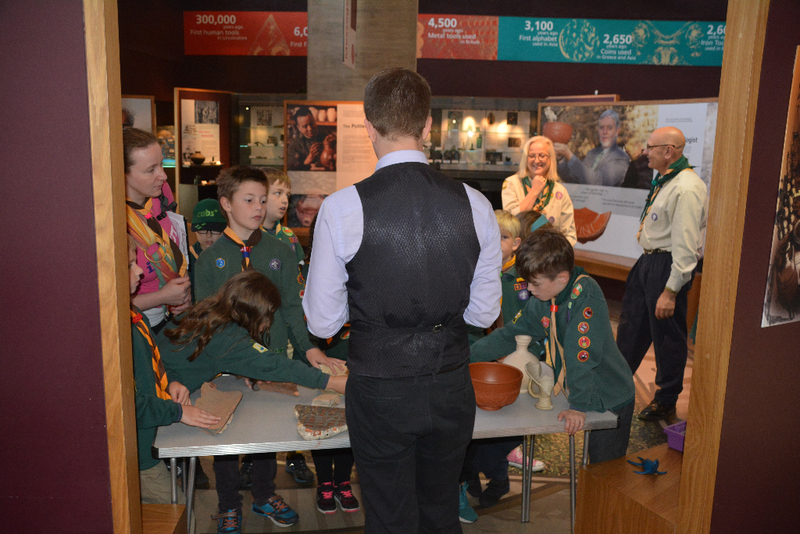 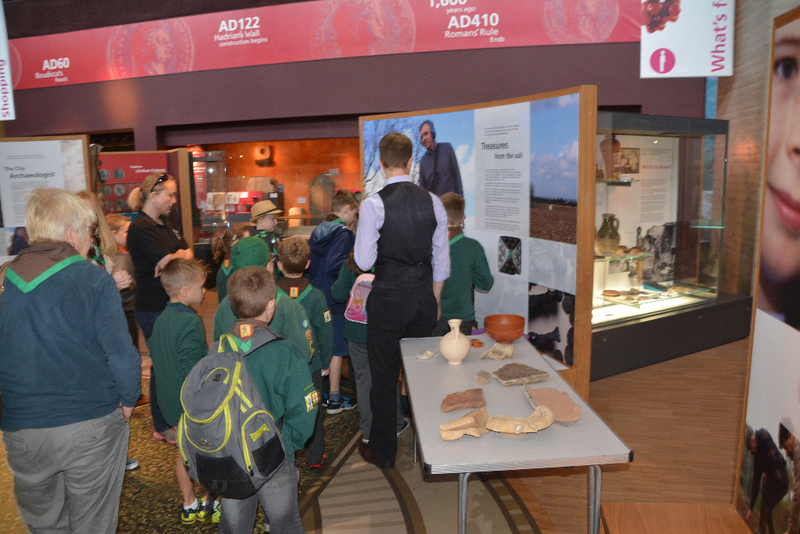 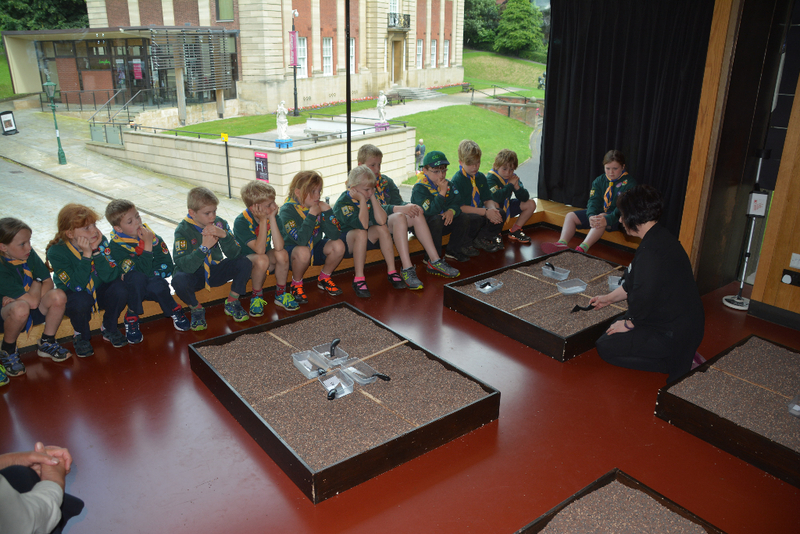 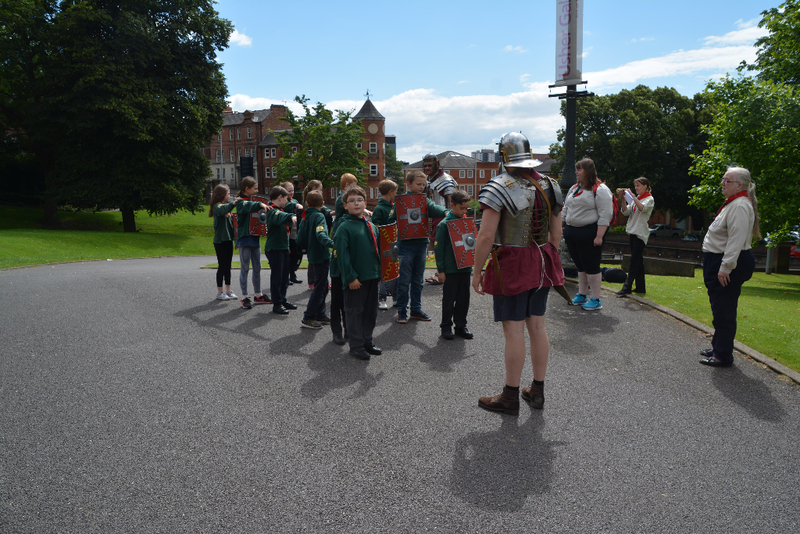 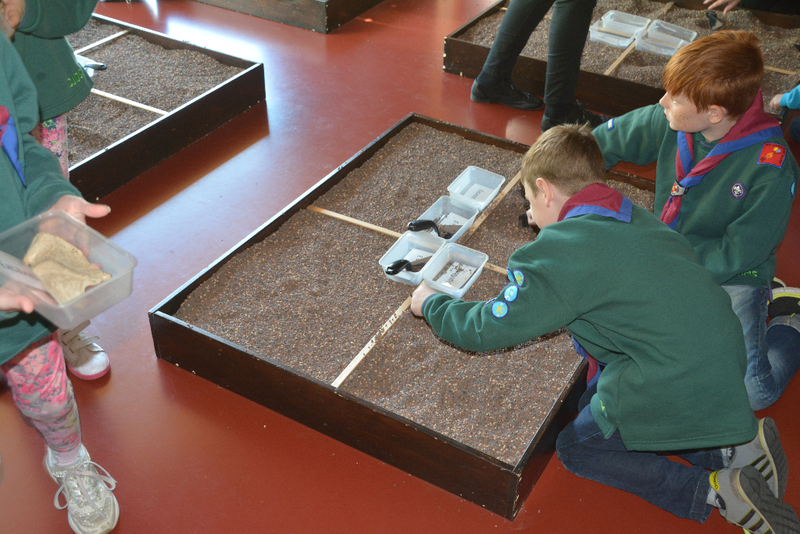 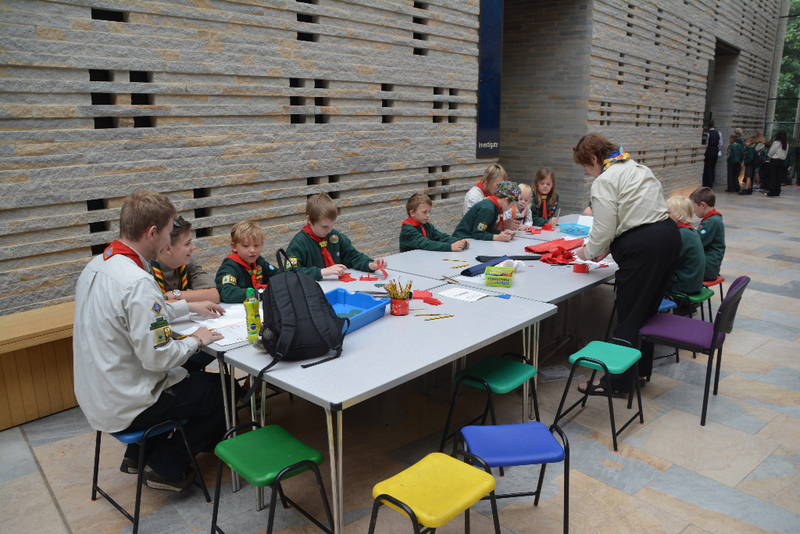 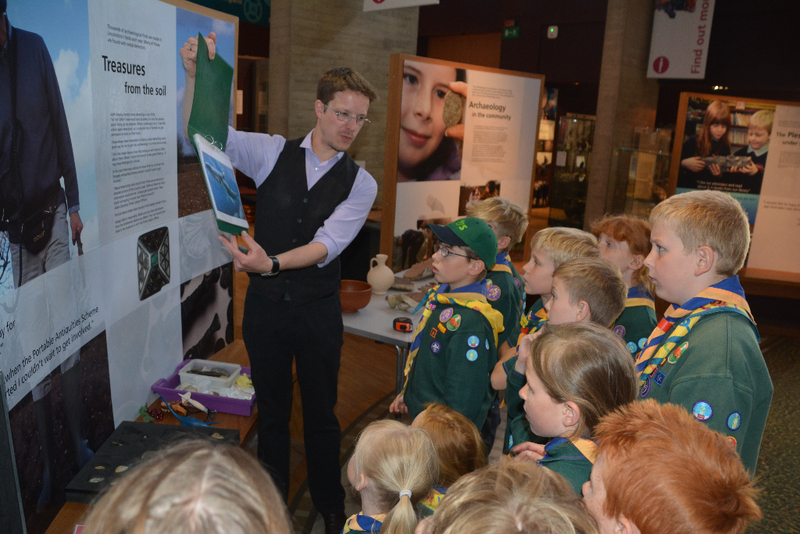 For the event the Cubs visited The Collection in Lincoln and learned to write their names in Hieroglyphics as well as march like Roman Soldiers! 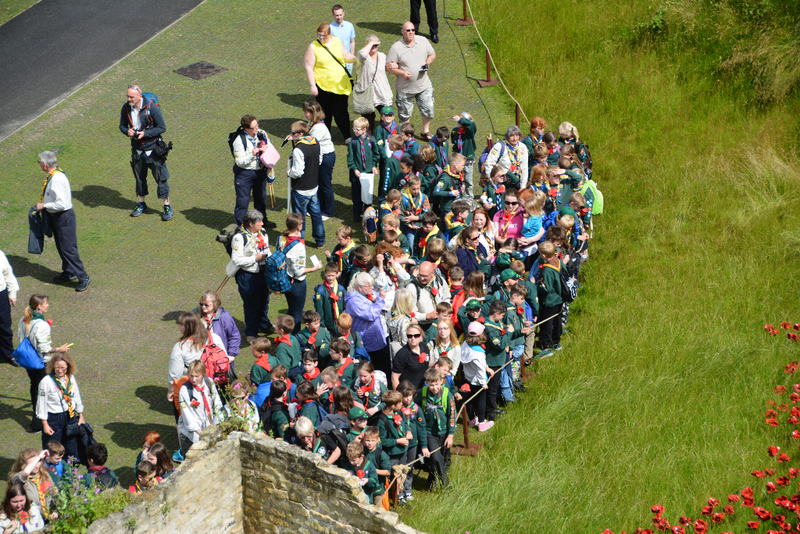 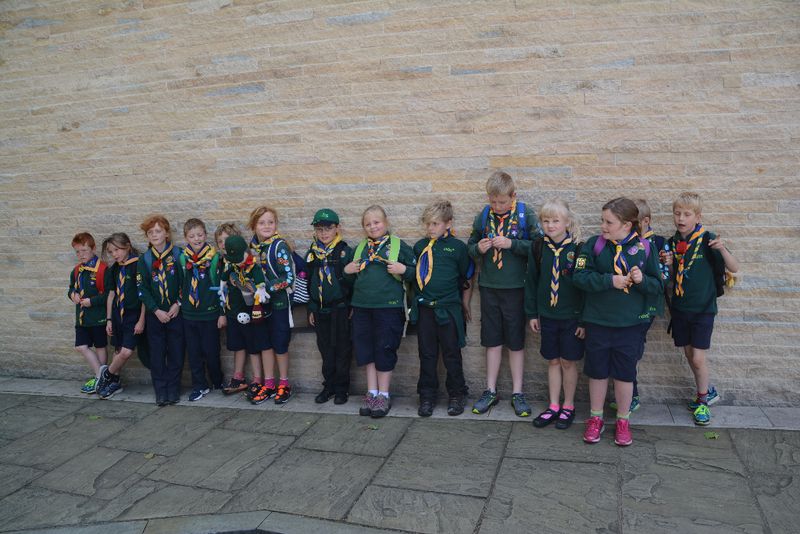 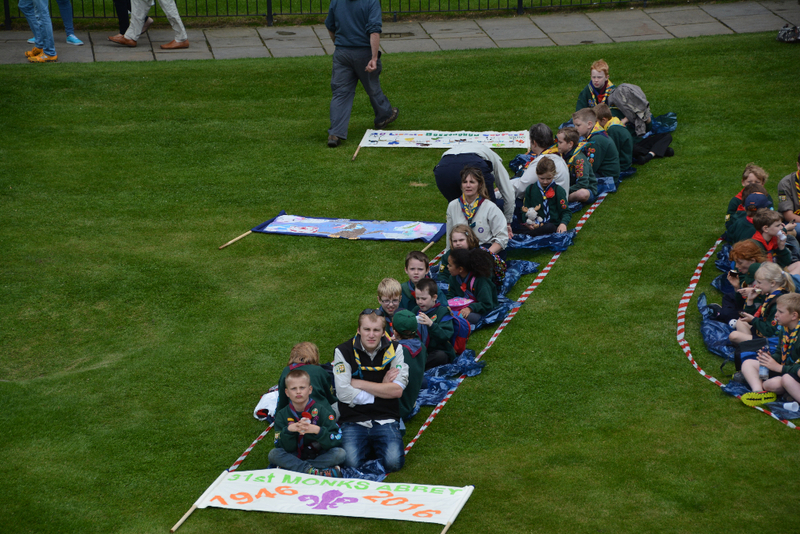 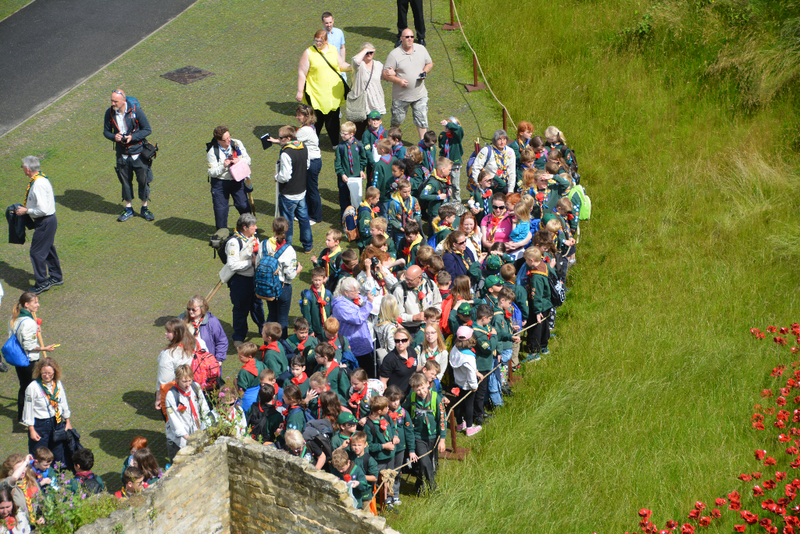 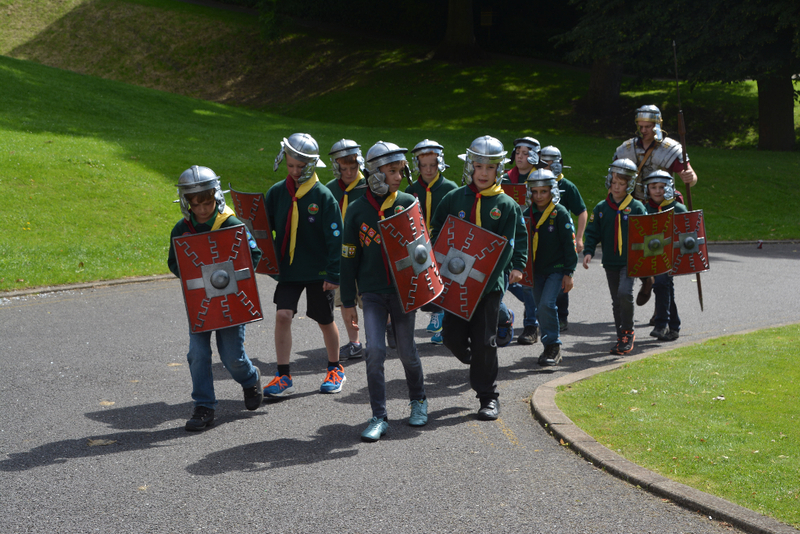 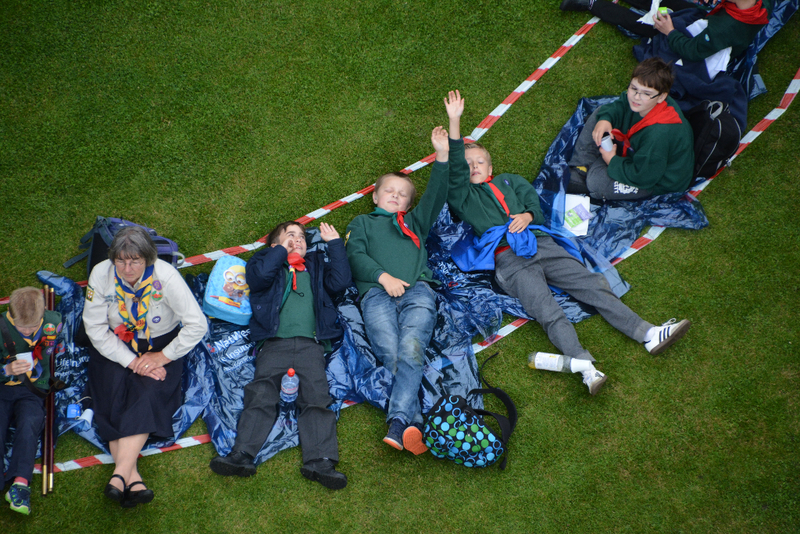 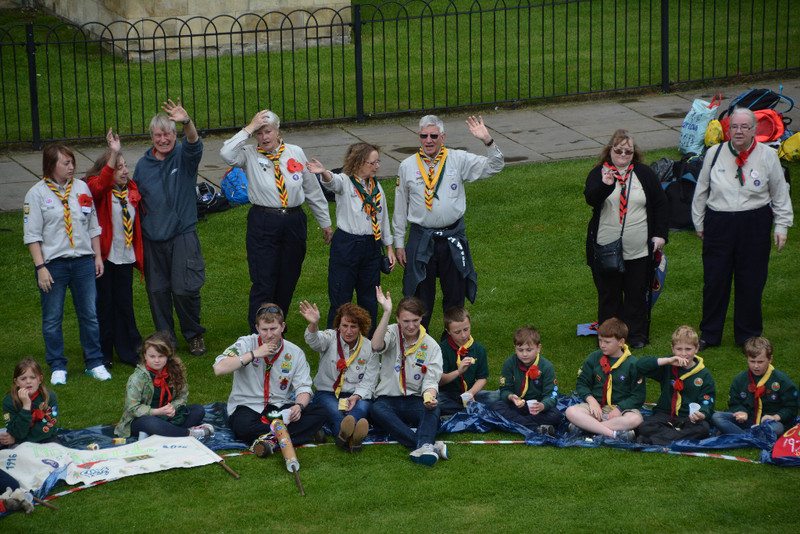 Following the visit to The Collection, the Cubs paraded up Steep Hill in Lincoln and through Lincoln Castle grounds. 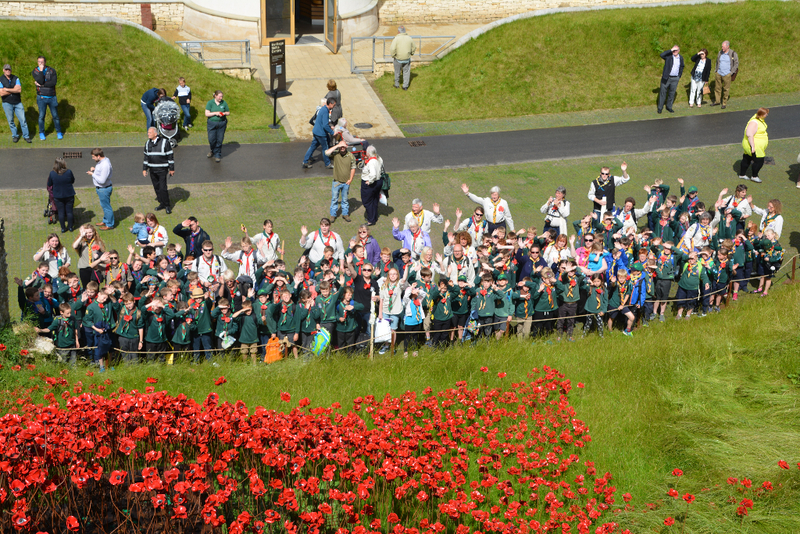 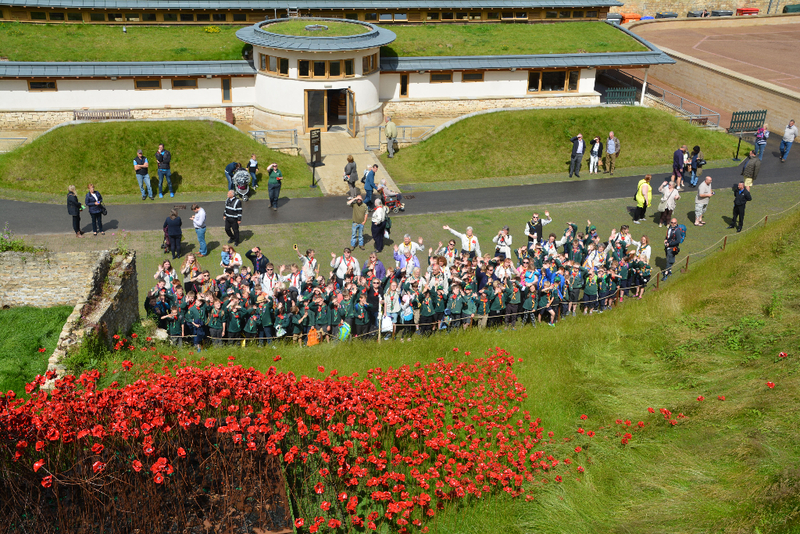 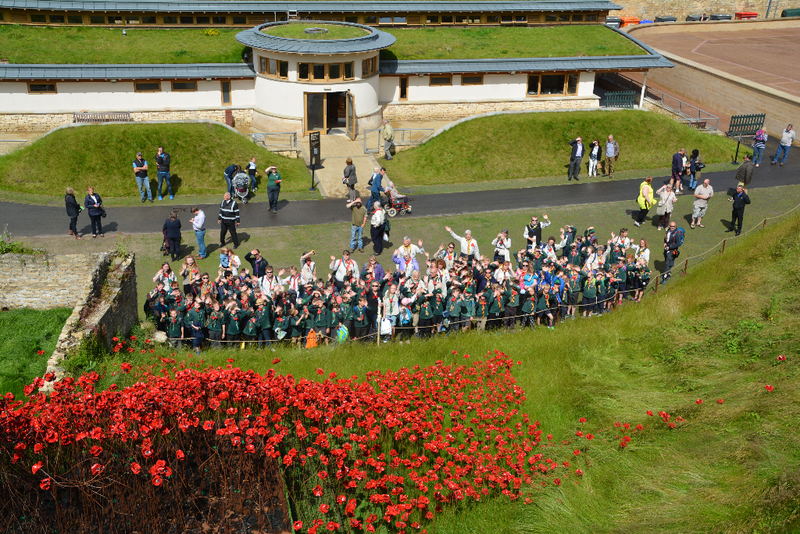 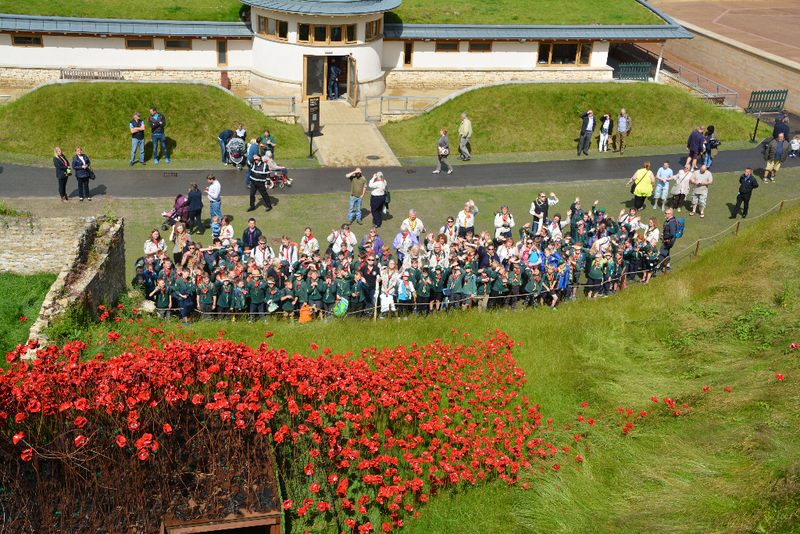 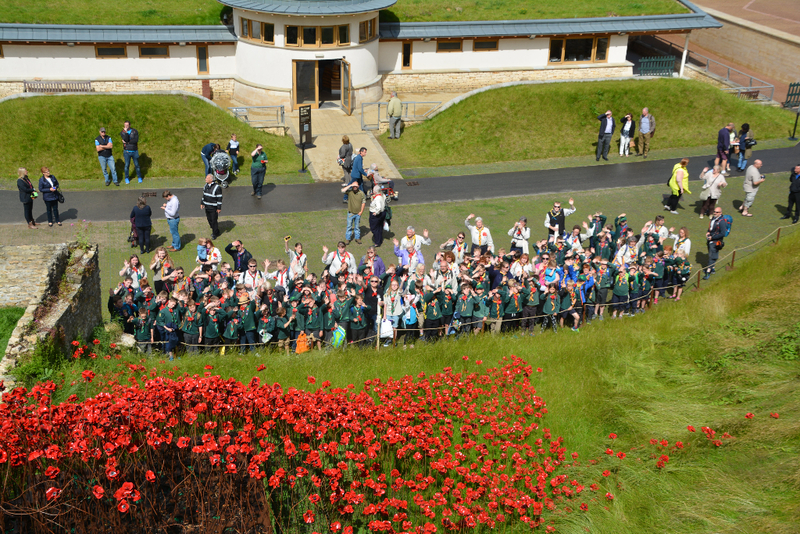 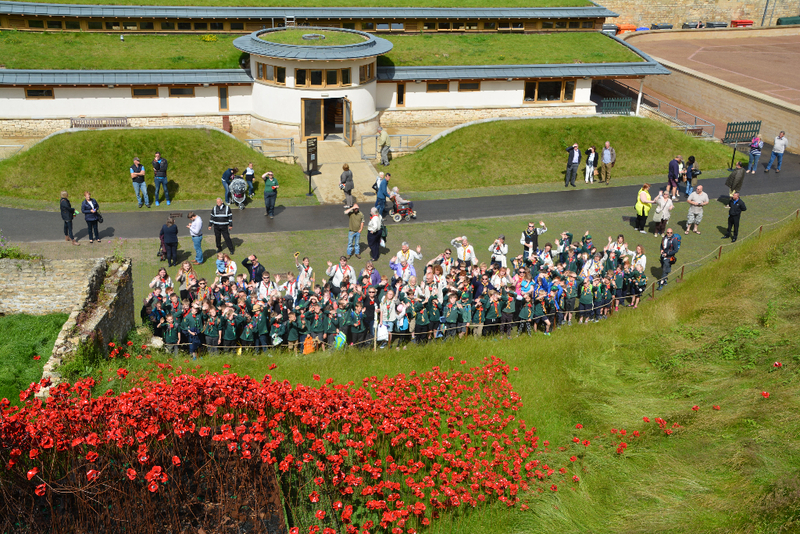 While they were at Lincoln Castle they paid tribute to the soldiers who took part in the Battle Of The Somme and they had the opportunity to view the ceramic poppy memorial marking the 100 years since the battle took place. 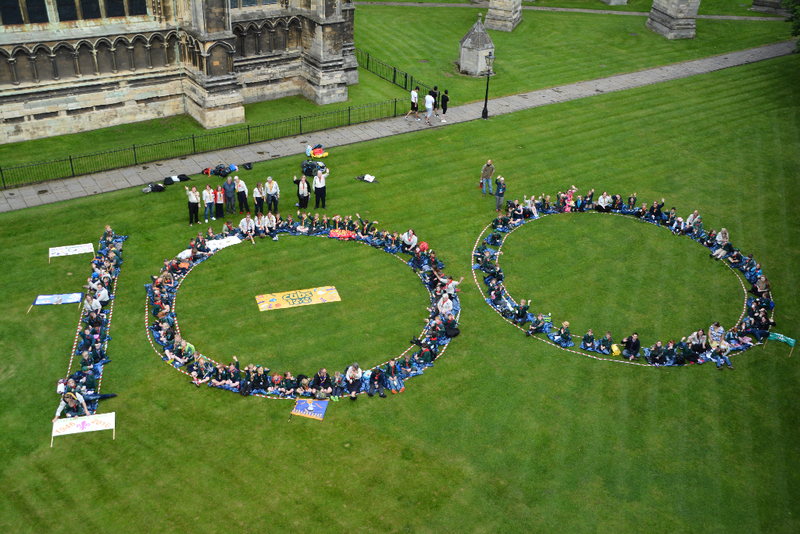 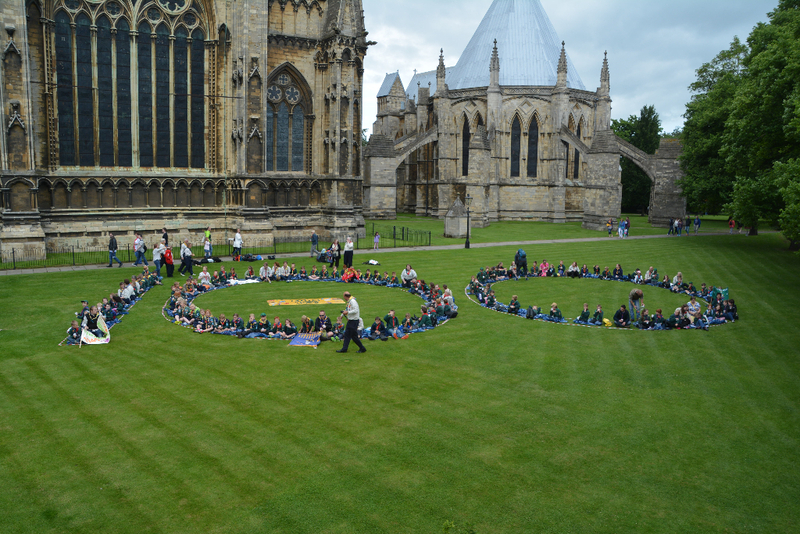 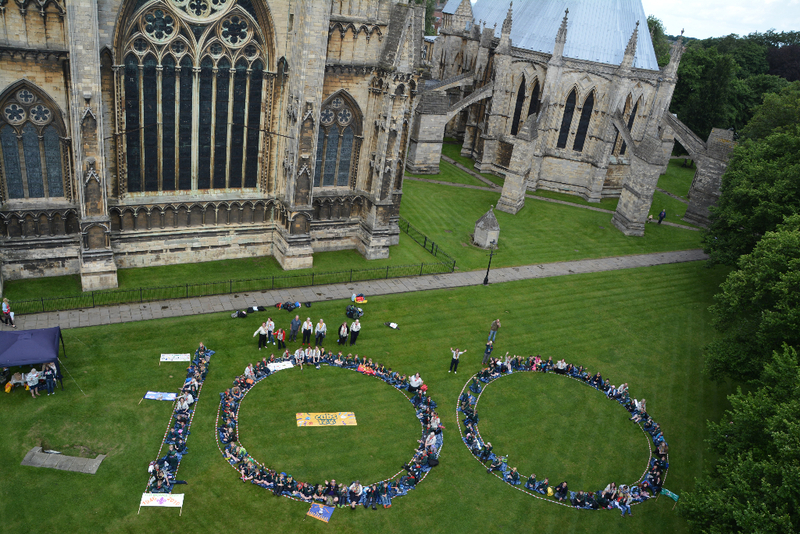 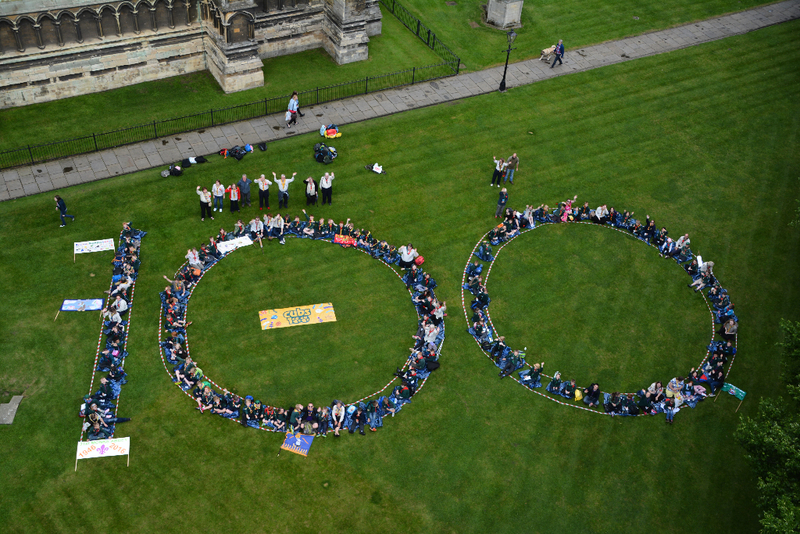 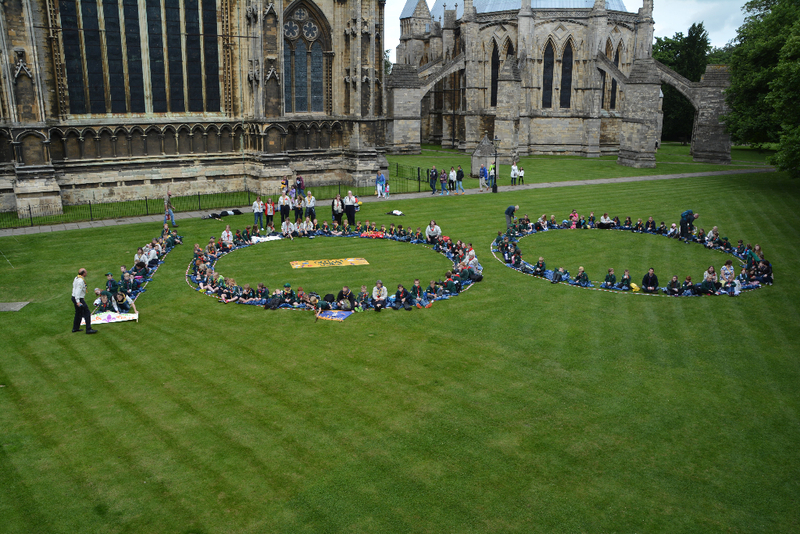 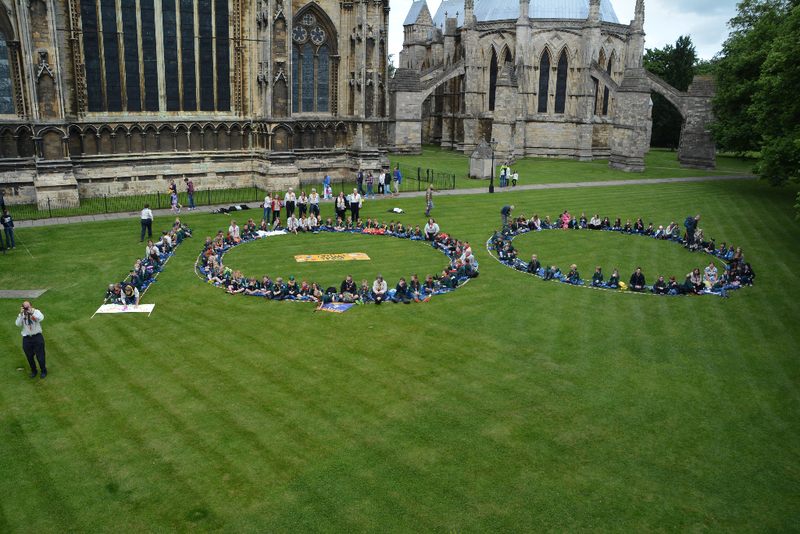 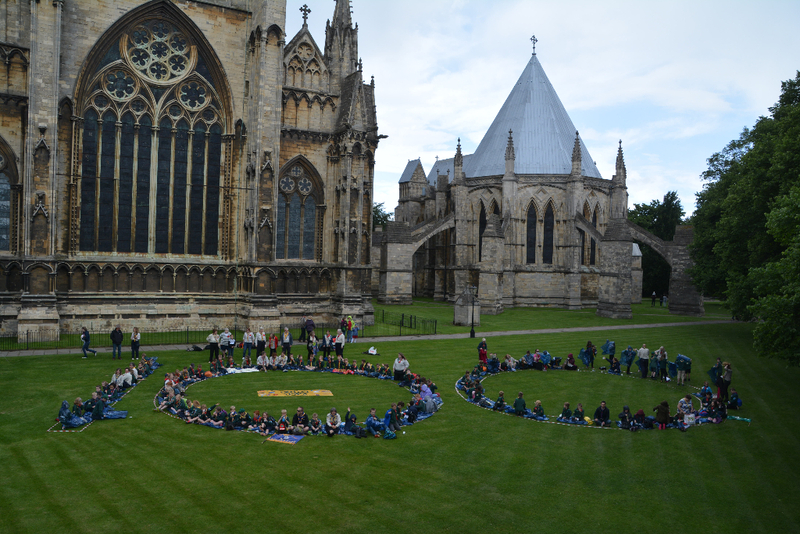 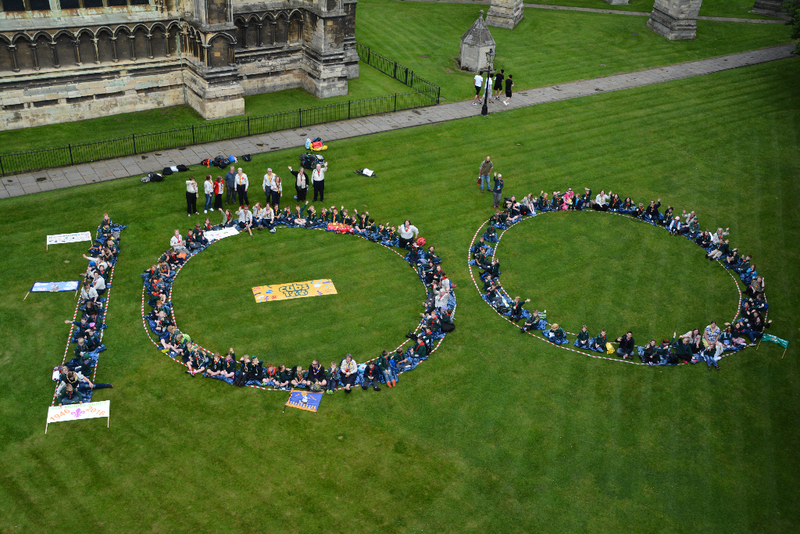 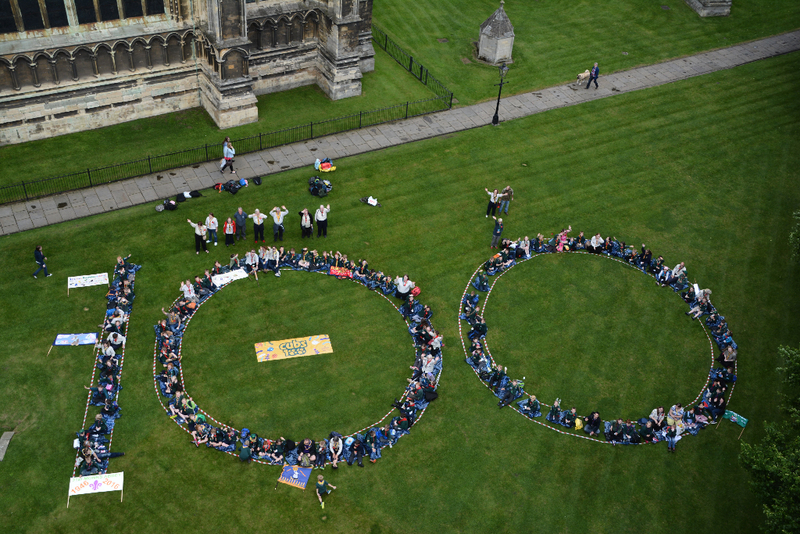 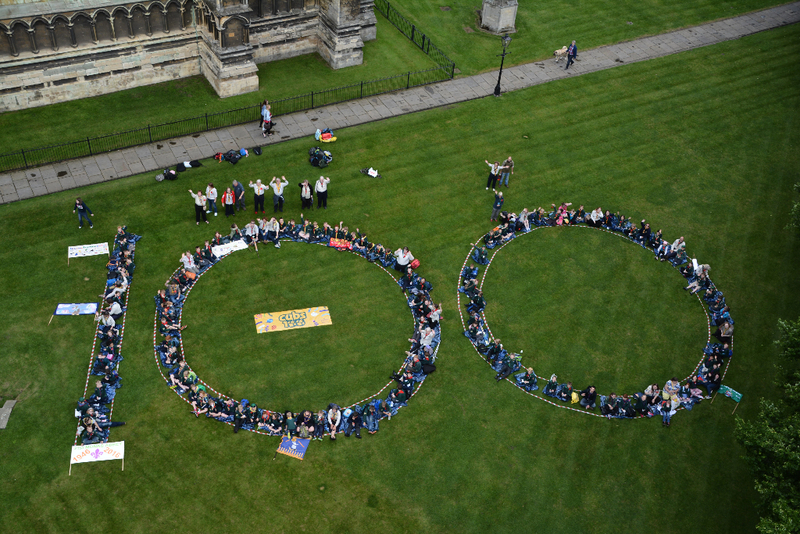 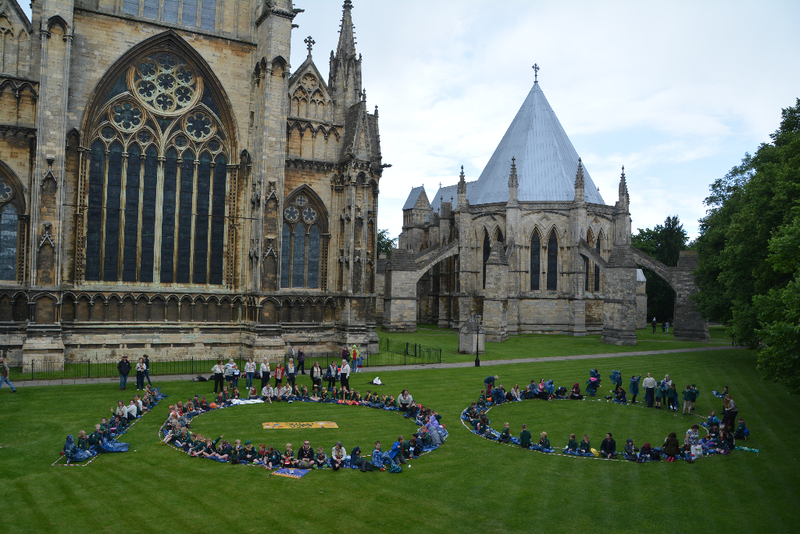 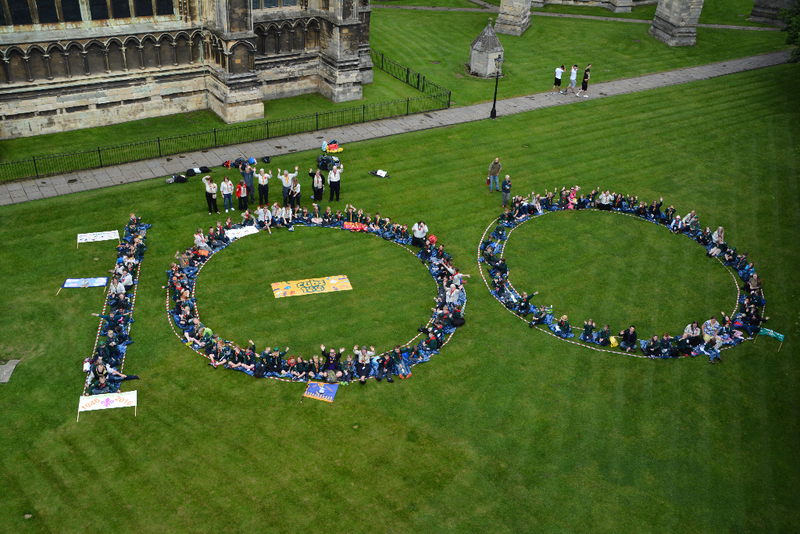 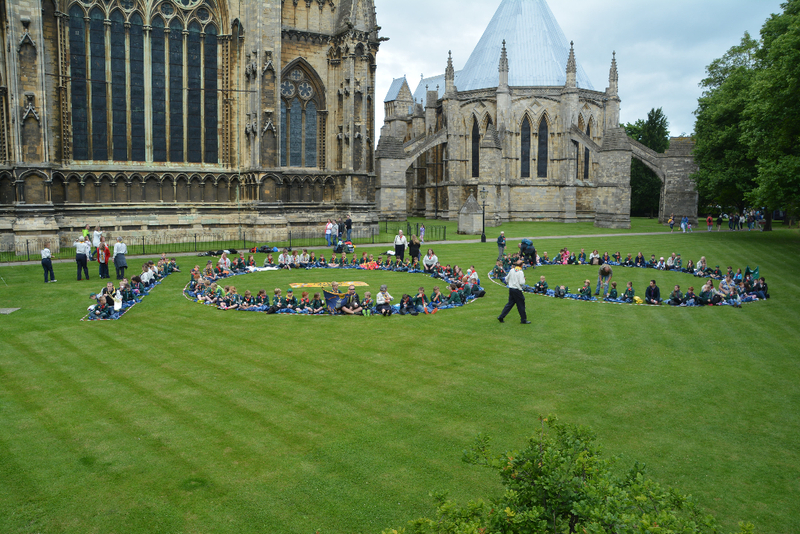 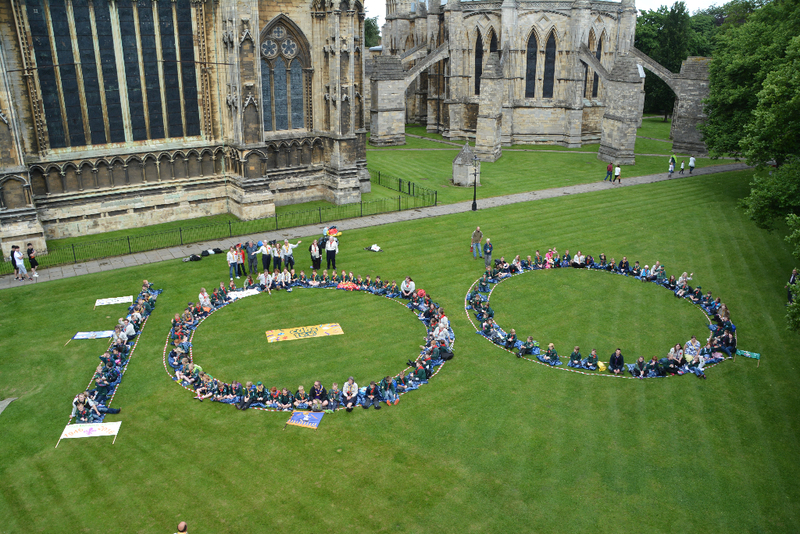 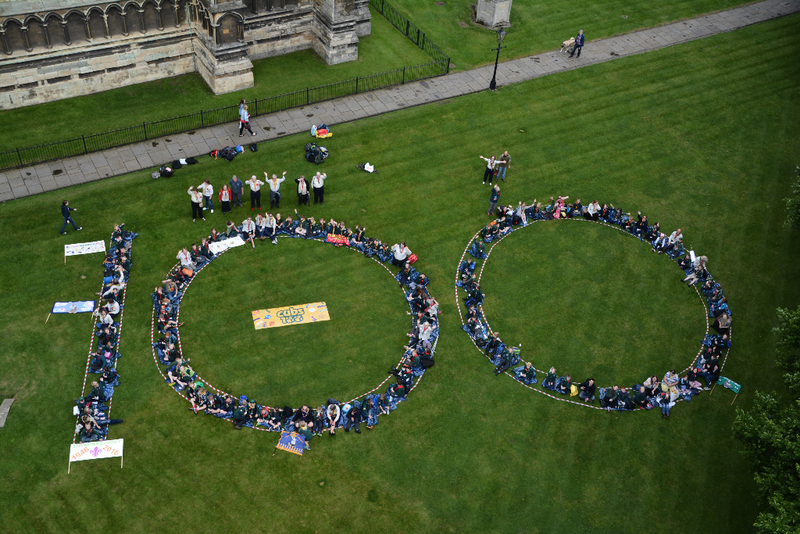 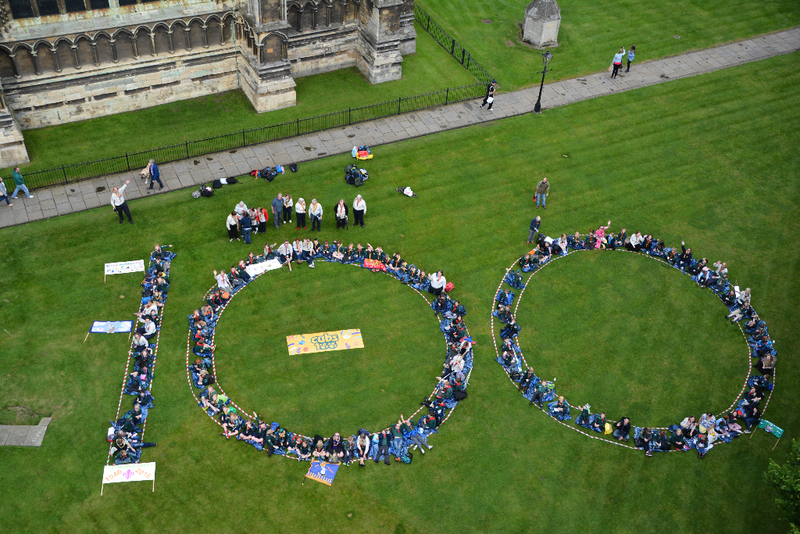 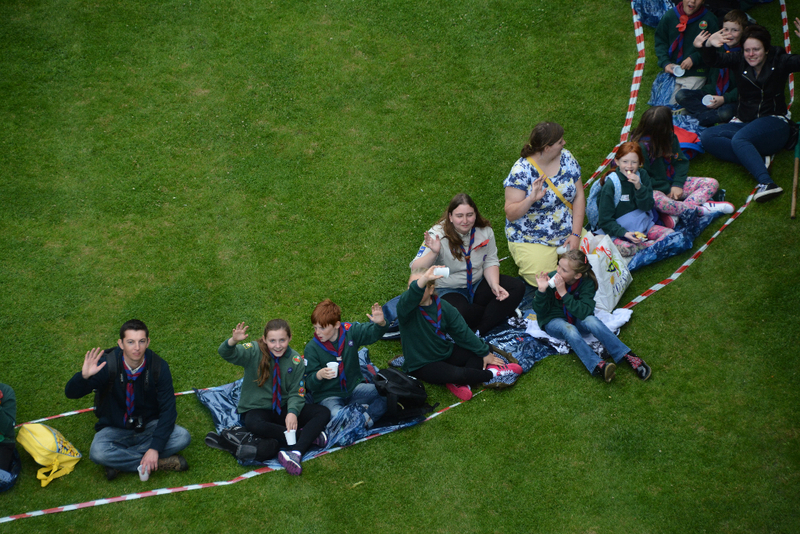 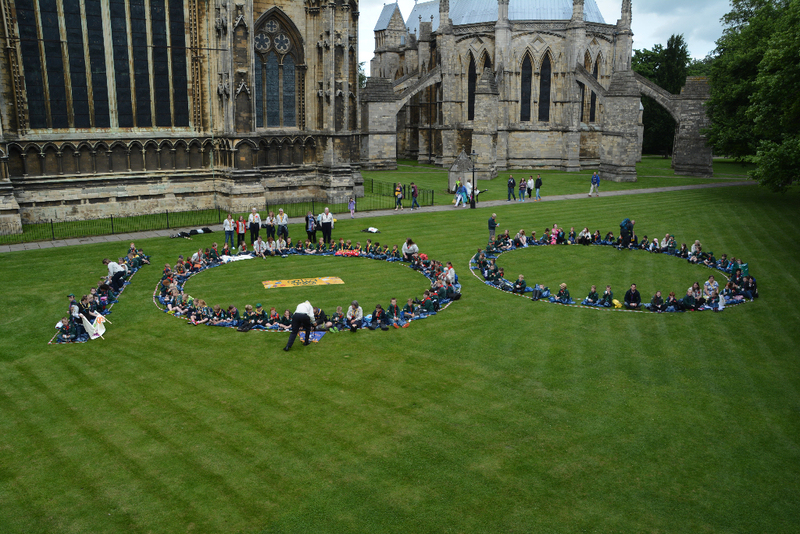 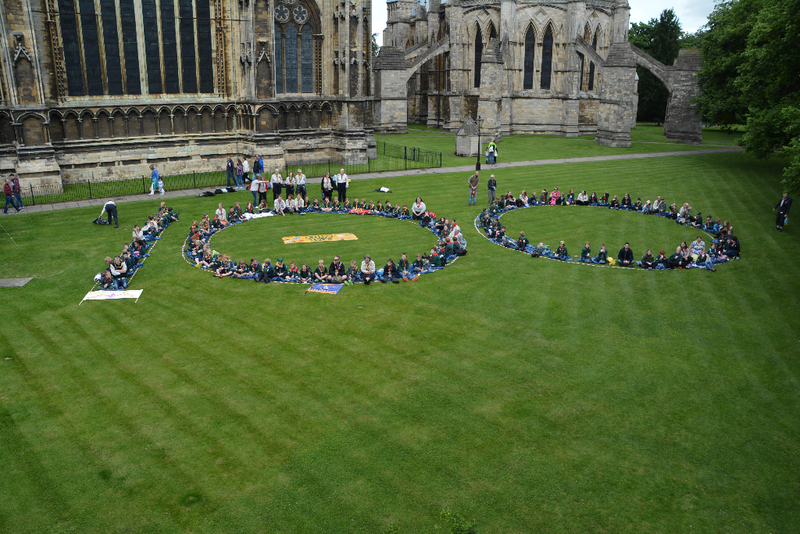 The Cubs then paraded across to Lincoln Cathedral and gathered into a ‘100’ formation for a photo opportunity. 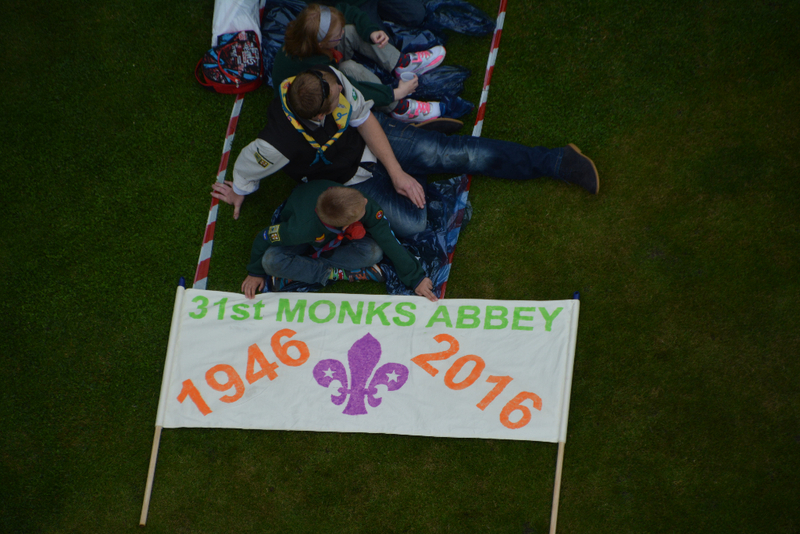 The Fire Service kindly brought ‘Simon’ the snorkel which lifted the Saxilby Scout Leader into the sky to take the photos! 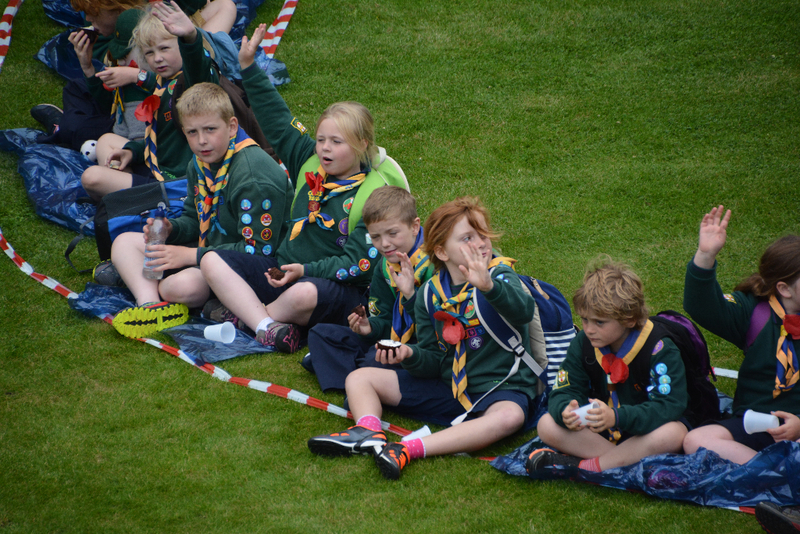 A quick reminder that it is the annual trip to the Saxilby Panto this Saturday. 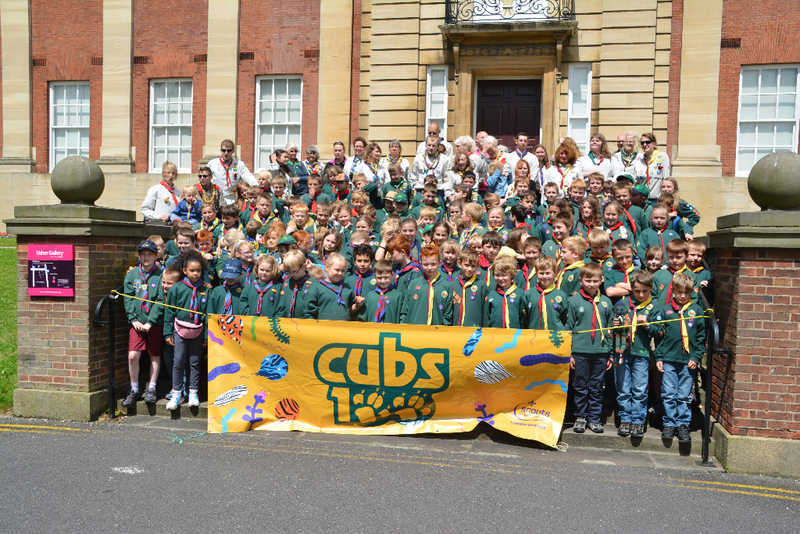 Please can all cubs who have paid for tickets meet in the entrance of the village hall at 2pm. 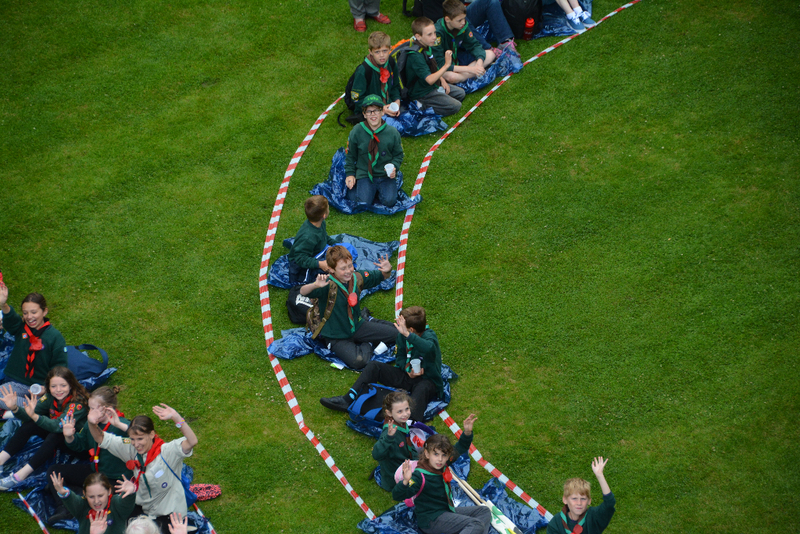 The show starts at 2:30pm. 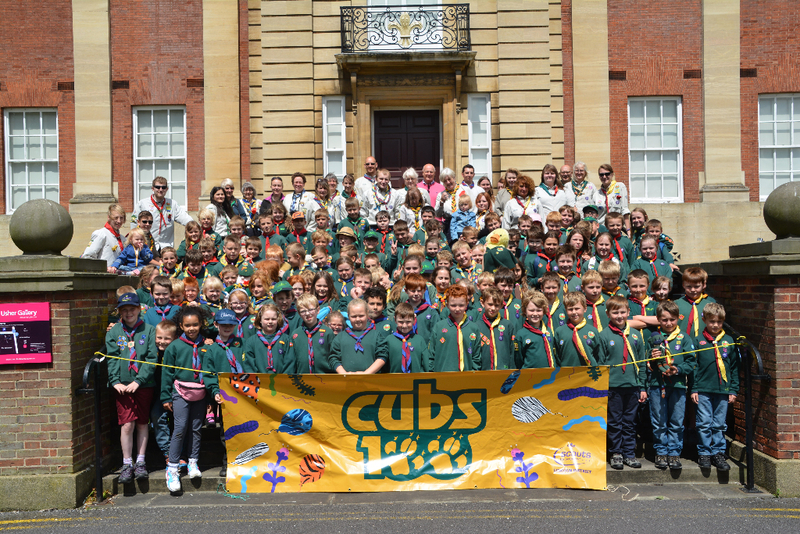 Keep your eyes peeled for some current and ex-cubs in the cast! 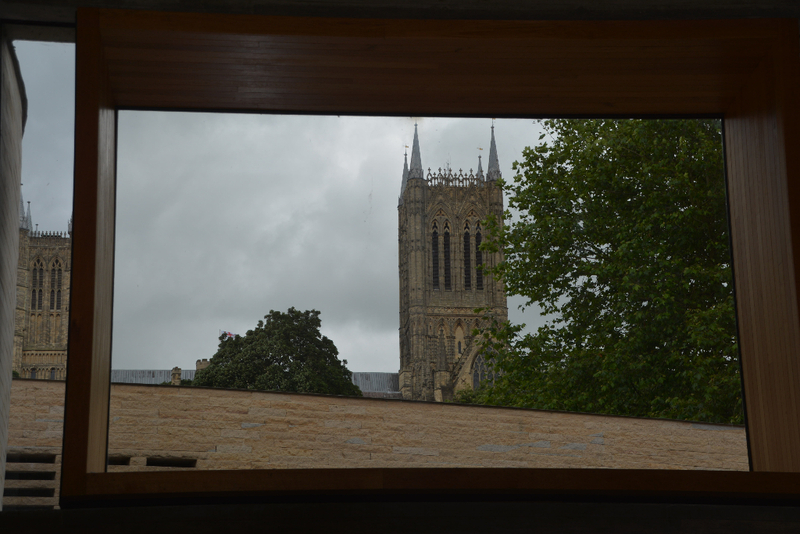 The Annual Mothering Sunday service will take place on Sunday 6th March 2016 at St Botolph’s Church. 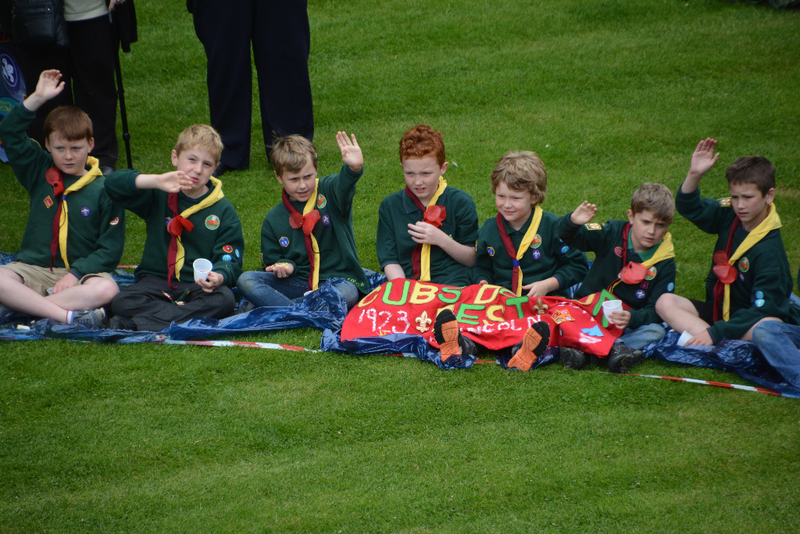 The service will start at 10:30 am, sections will meet in the Church Hall by 10:00 am. 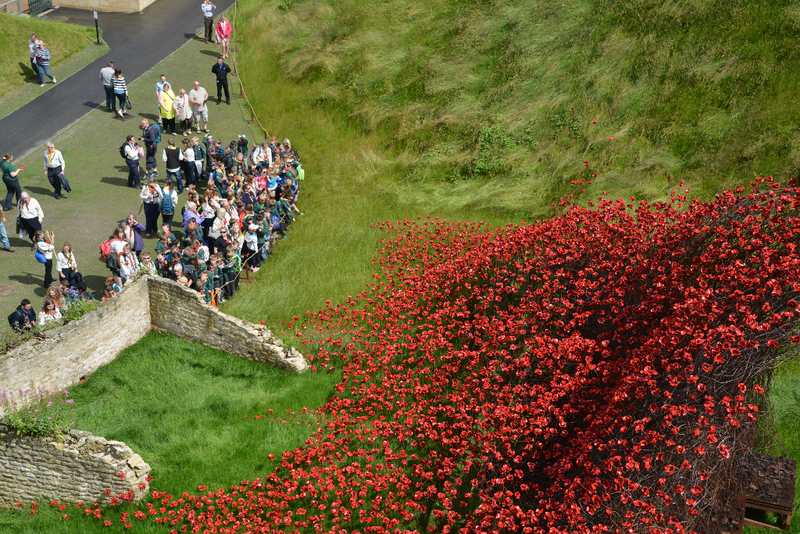 This year’s service will be the same as last year, a family communion format but shortened as much as possible and will still include pieces from all sections. 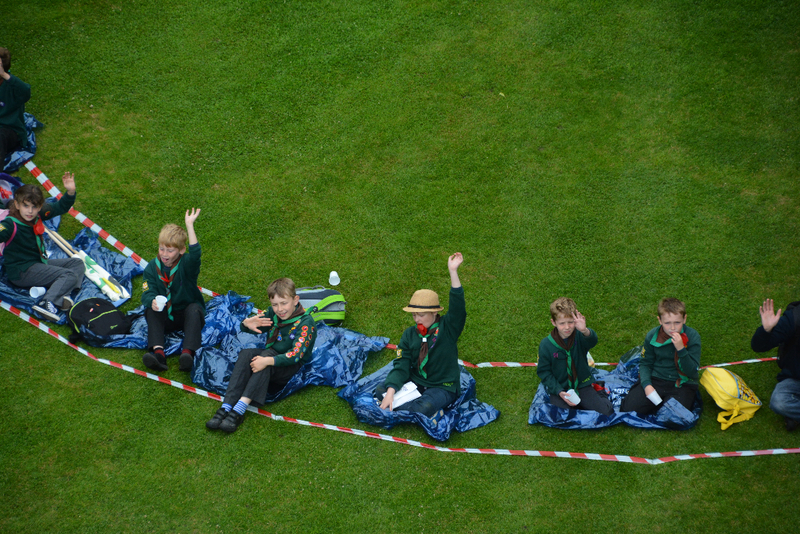 The Length is less than an hour. 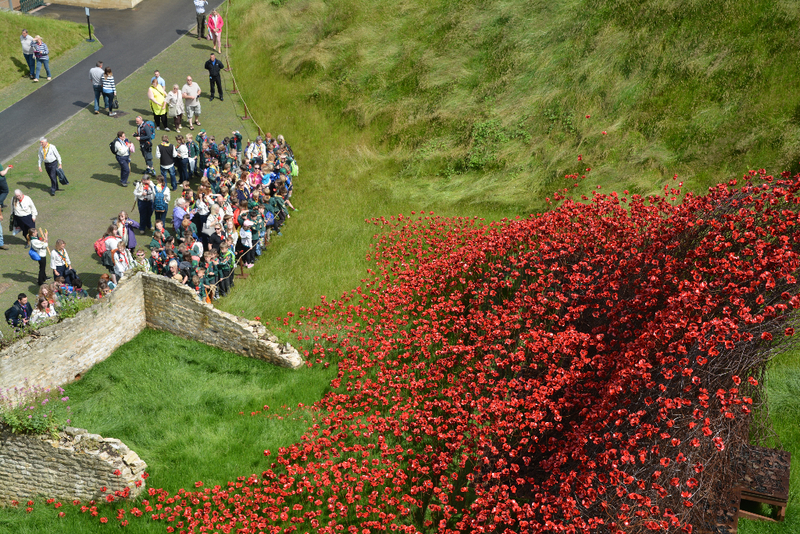 Flags will be paraded, a posy of flowers prepared by the Mothers Union will be given to all Mums present and there will also be simnal cakes and a drink after the service in the church. 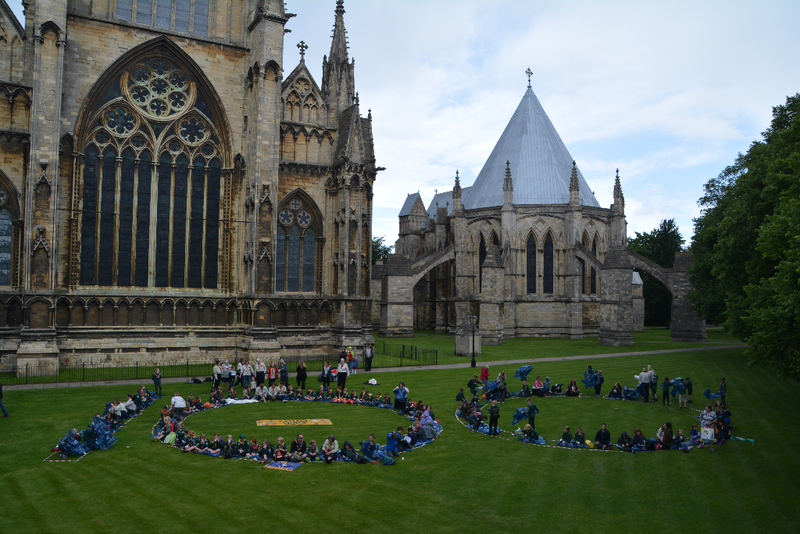 So, please come along and give your support to the children and leaders. 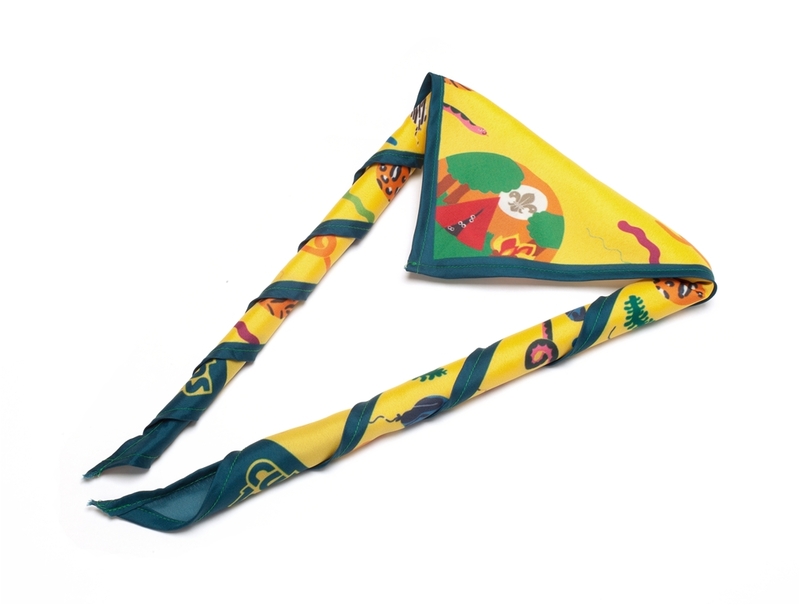 To celebrate Cubs100 a special necker has been made available to wear alongside the usual necker. It is £4 in the Scout shop but we have subsidised the cost of this so that Saxilby Cubs can get one for £2. If you would like one then please complete the form sent home with the Cubs last night and bring it in with £2 at the next meeting. 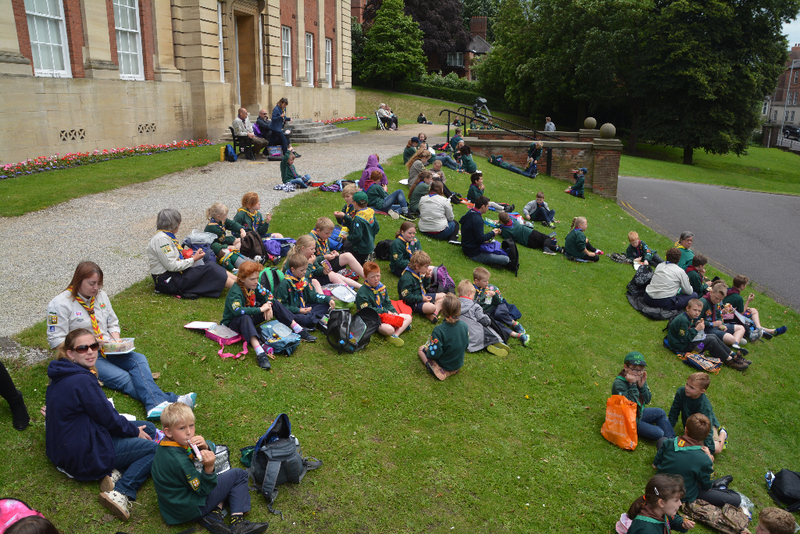 Calling all potential musicians! 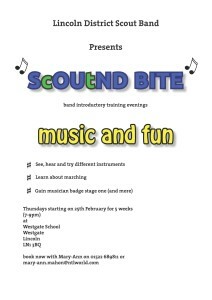 The Lincoln District Scout Band is running some introductory training evenings. 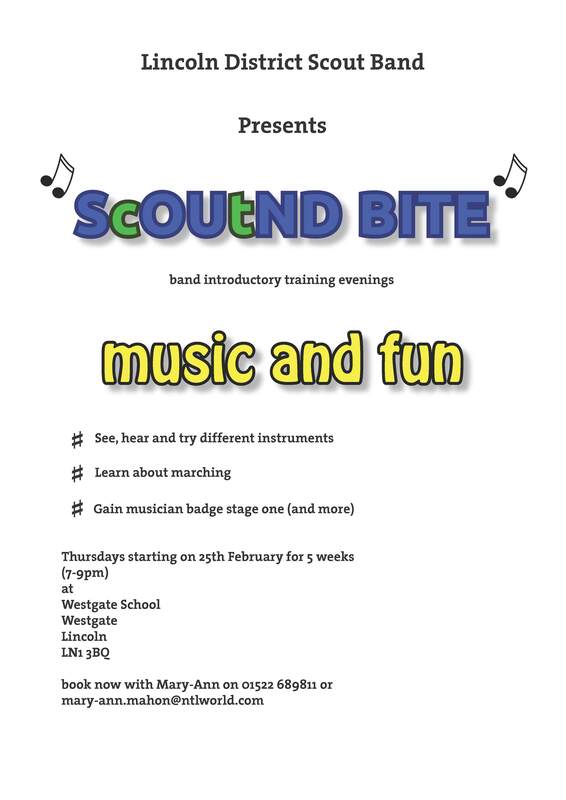 If you have always fancied a go on a trumpet, snare drum, flute, clarinet, bell lyre or a bugle then this may be for you. 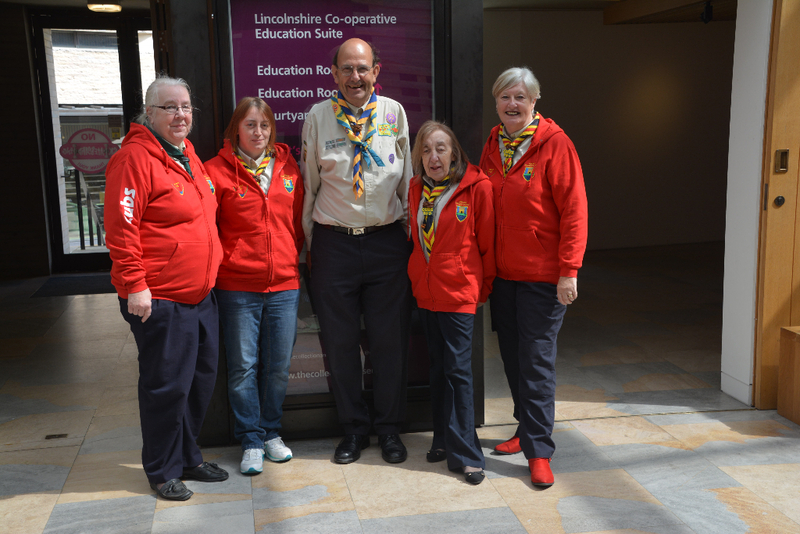 We have been contacted by the University of Lincoln to assist them with their ‘Our Lincolnshire’ campaign. 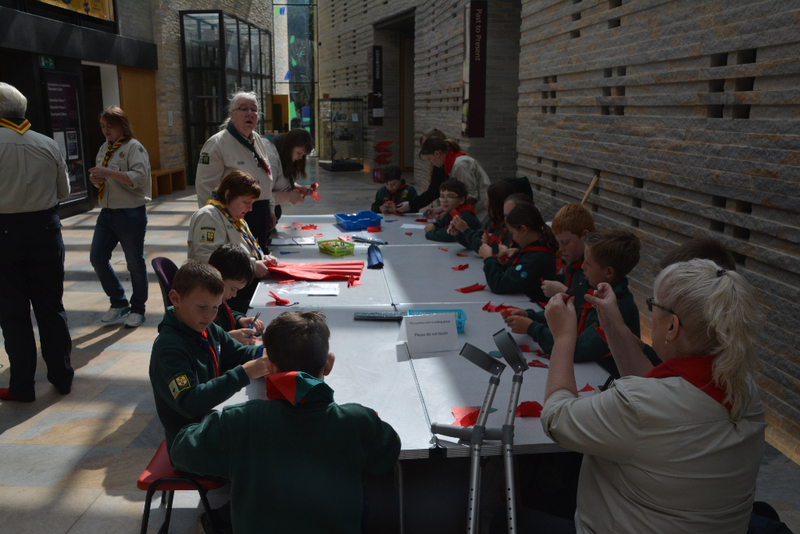 They are performing a study on what the people of Lincolnshire think about their heritage. 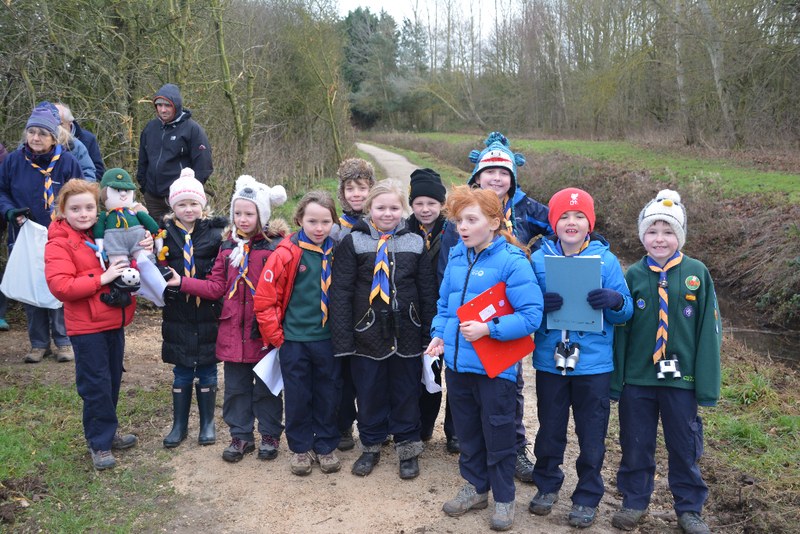 They would like the children and young adults from all groups to fill out the survey (link below) which should take around 15 minutes for over 10’s and around 5-10 minutes for under 10’s. 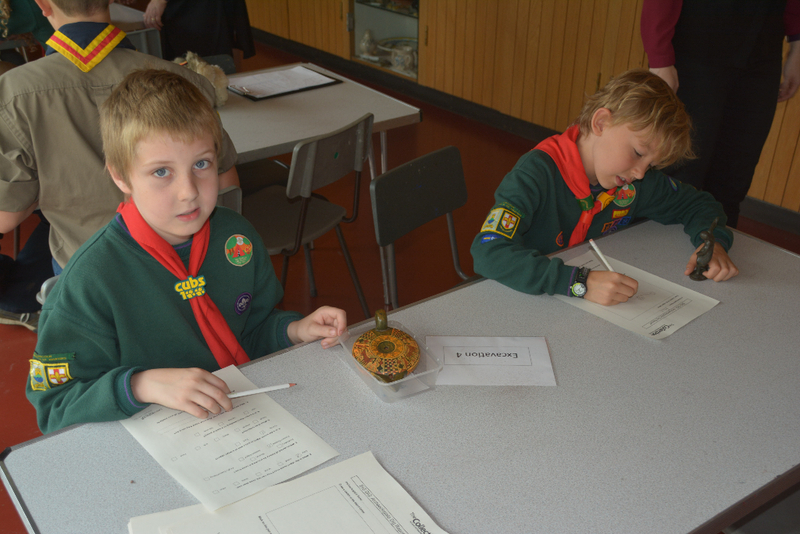 If the children let their group leader know if they filled out the survey then this activity may count towards badge work. You can check out the full gallery here. Happy New Year to everyone! 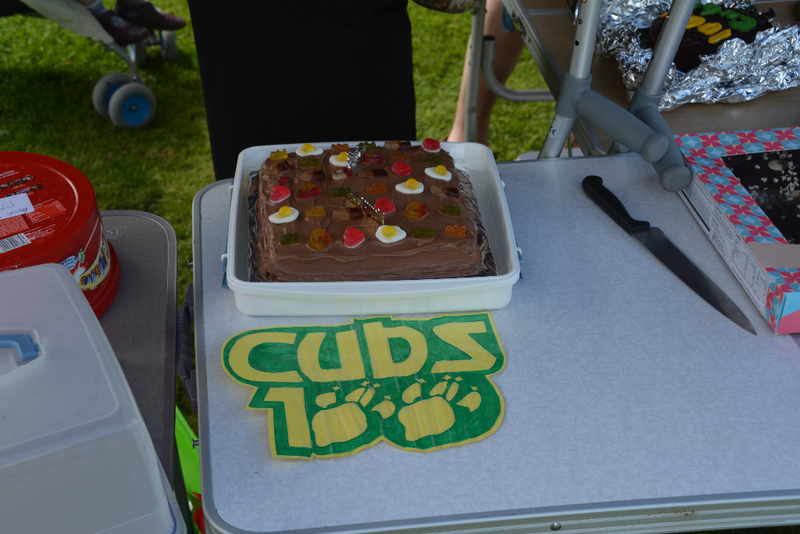 This year is an exciting year for the Cubs as we will be celebrating our 100th birthday! 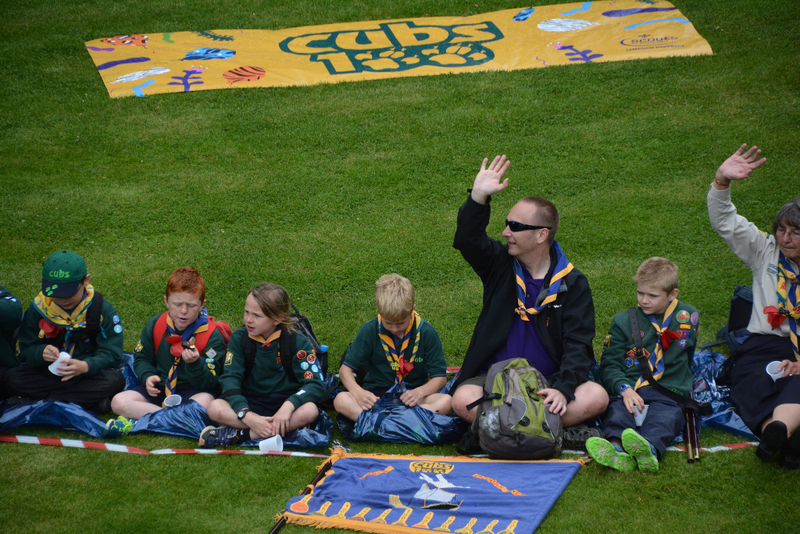 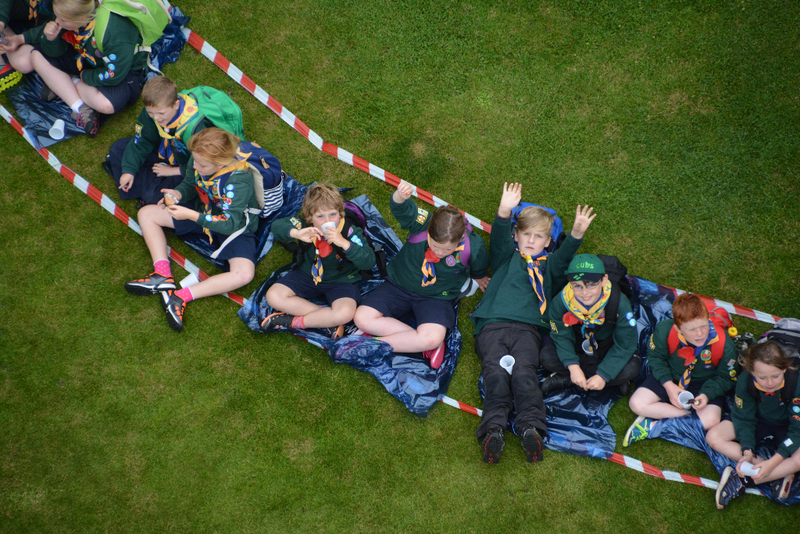 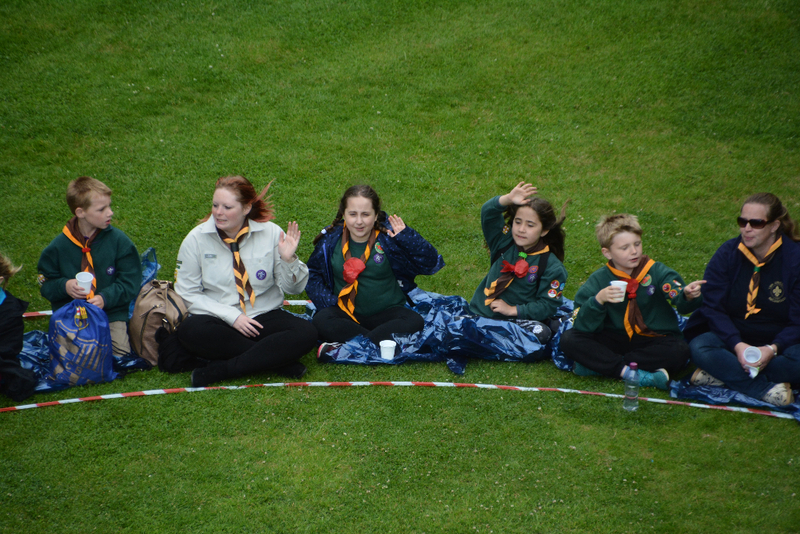 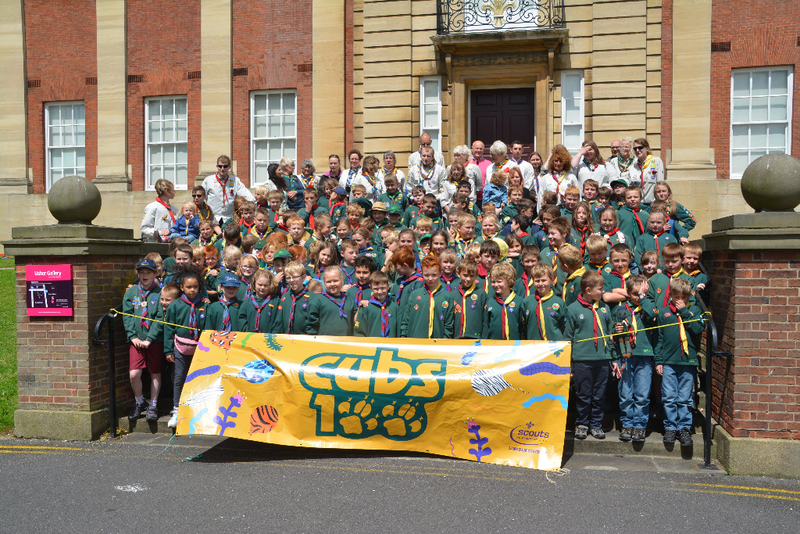 Throughout the year there will be a number of events and challenges to mark what is Cubs100. 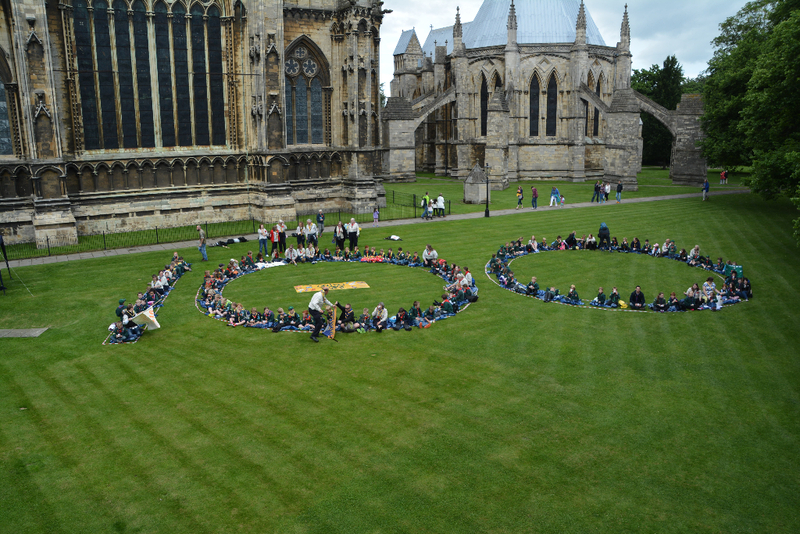 Keep your eyes peeled for further information on this! 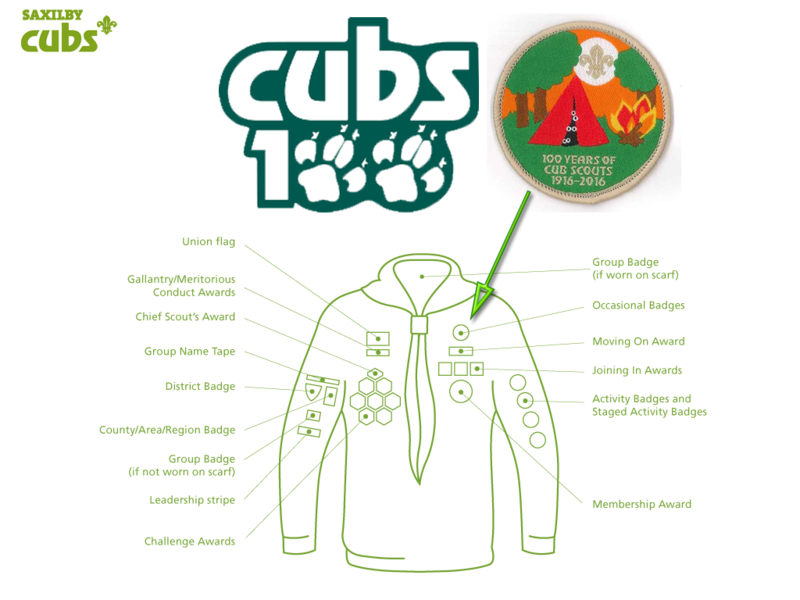 The Cubs have already received their Cubs100 occasional badge, so it seems an appropriate time to show you where the badge should be placed on the uniform. 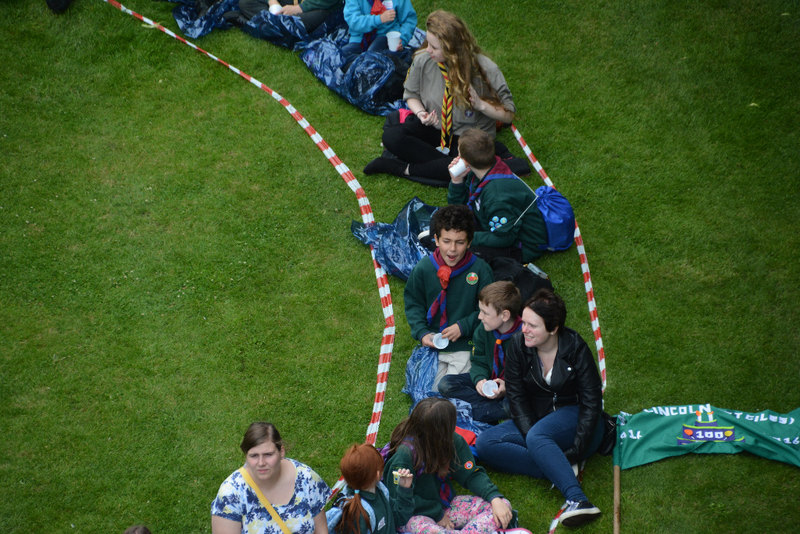 The attached diagram should be of help! 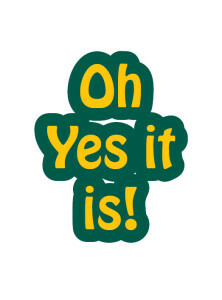 This is an ‘Occasional Badge’ which is a badge celebrating a one-off occasion and is worn on the uniform for a temporary amount of time (usually about a year). Your cubs may already have an occasional badge on their uniform, in which case this should be removed before stitching on the Cubs100 badge. 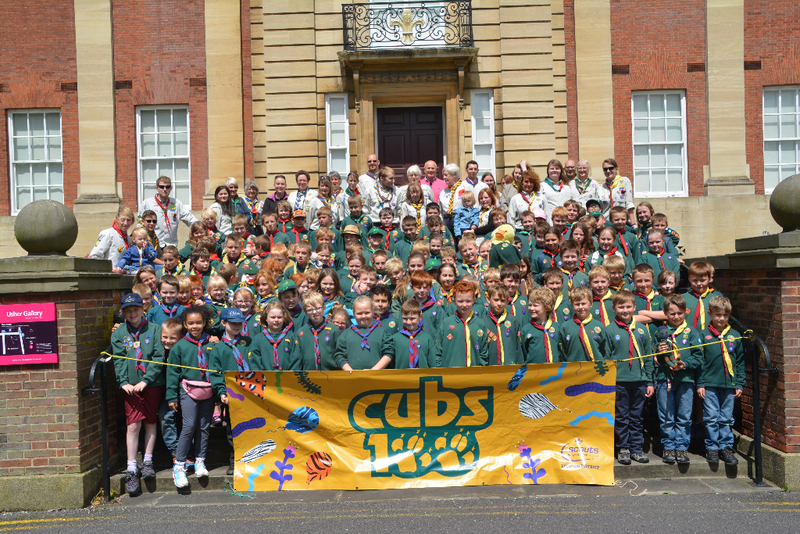 Stay tuned for news of the Cub's big year in 2016!